Miyao castle (宮尾城) is built at Yougaiyama-hill, one of about 30 meter height at the western edge of Miyajima town at Itsukushima island. 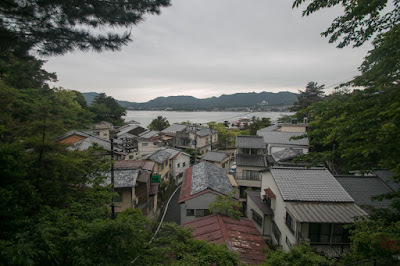 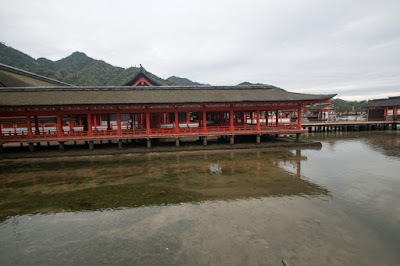 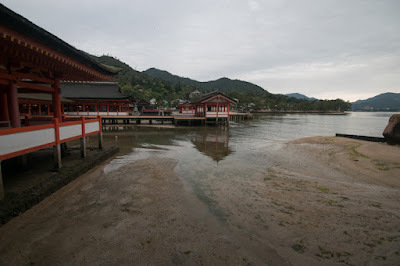 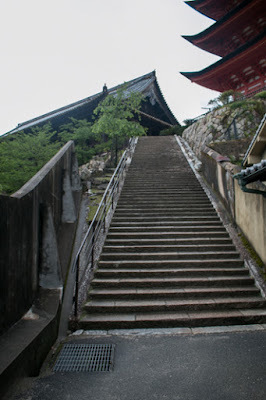 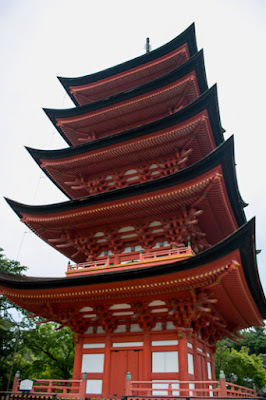 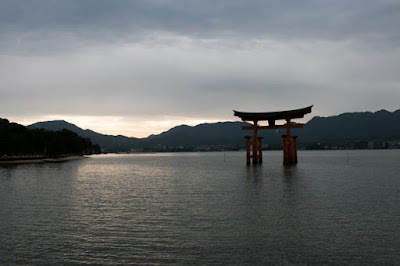 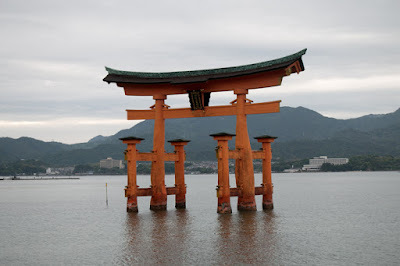 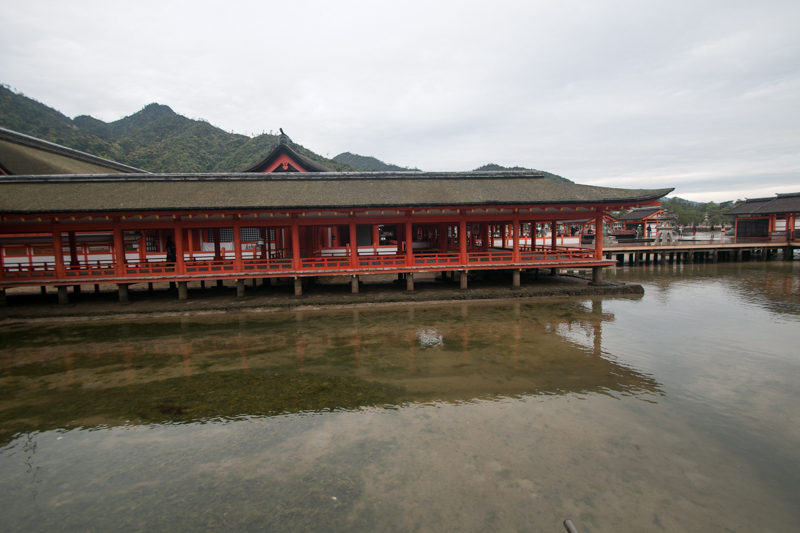 Itsukushima island is about 8 kilometer long and 3 kilometer wide island at the west of Hiroshima bay, mostly covered by mountain and only has small flat area at its northern part. 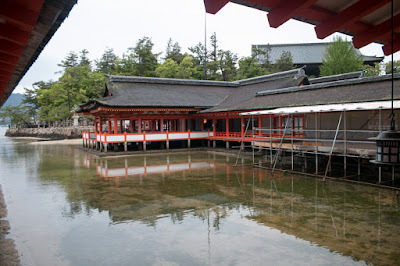 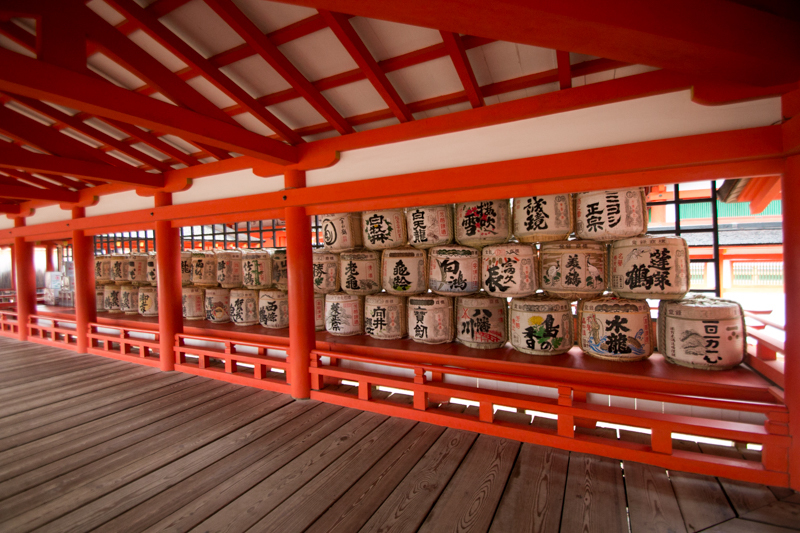 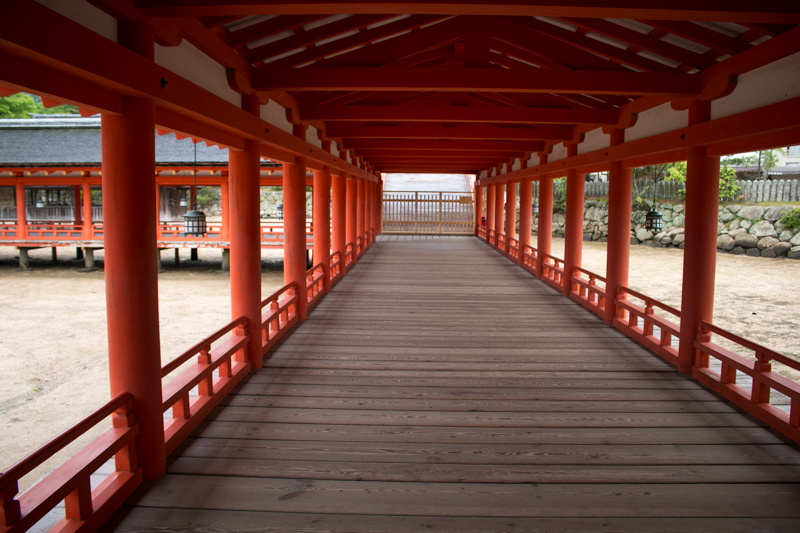 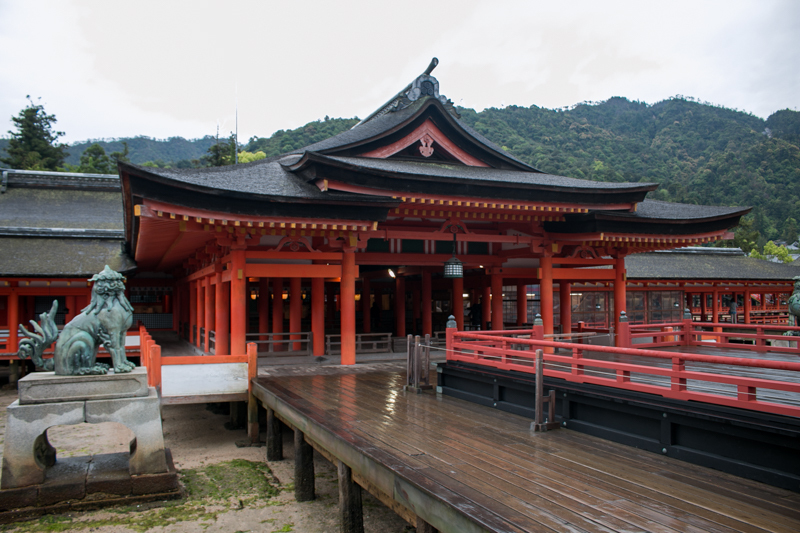 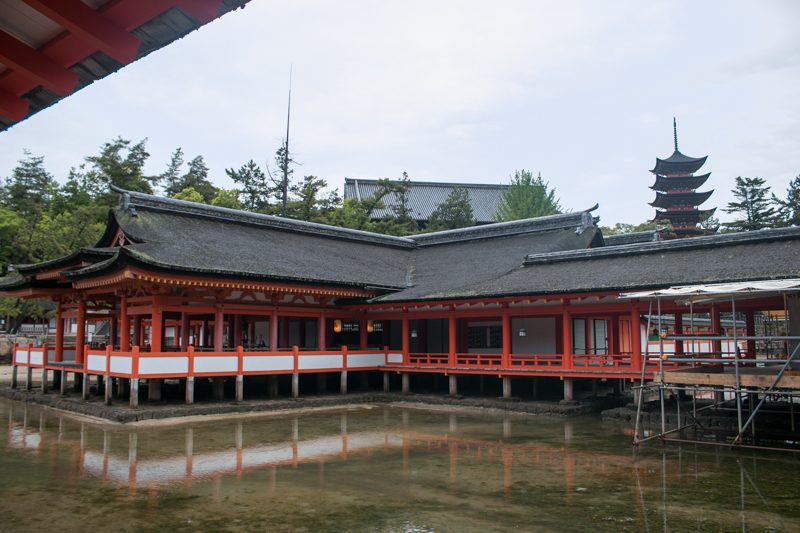 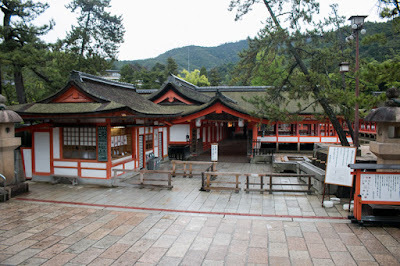 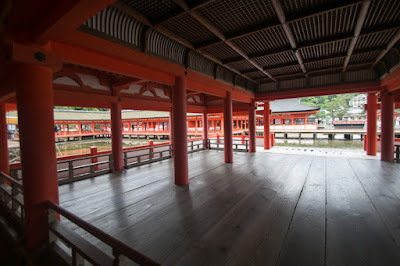 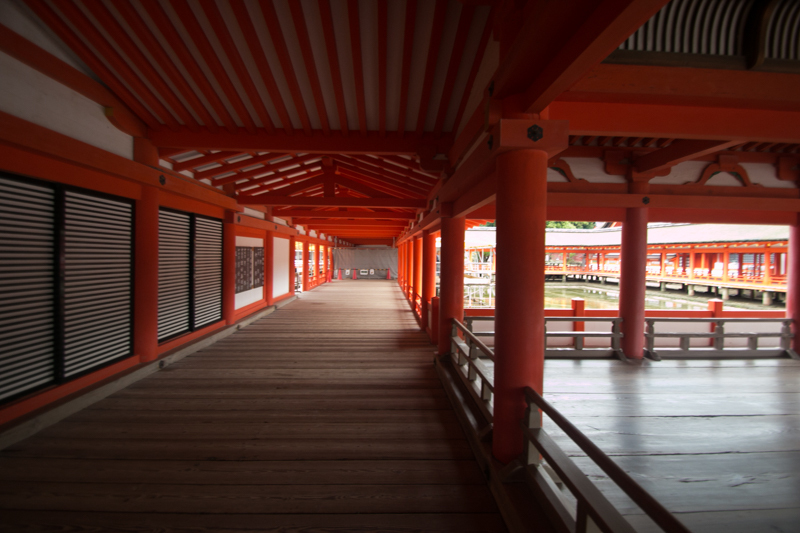 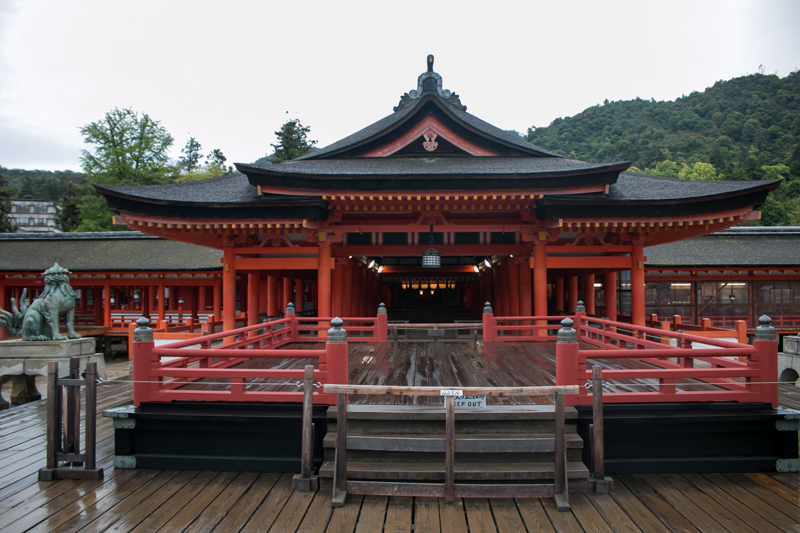 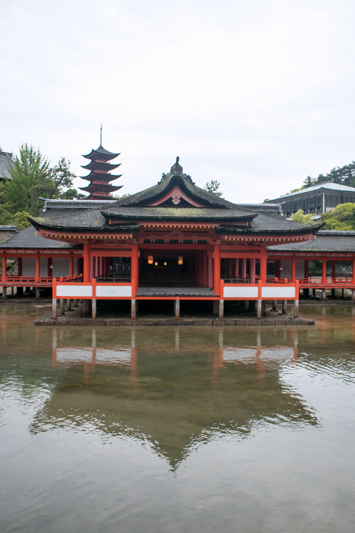 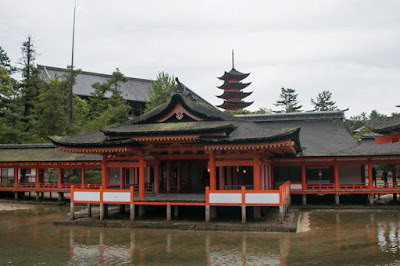 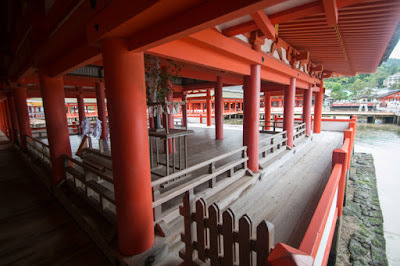 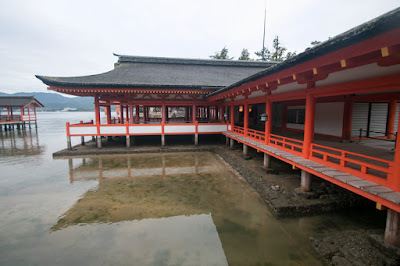 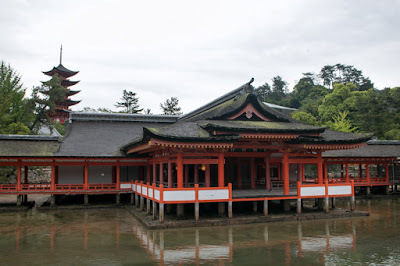 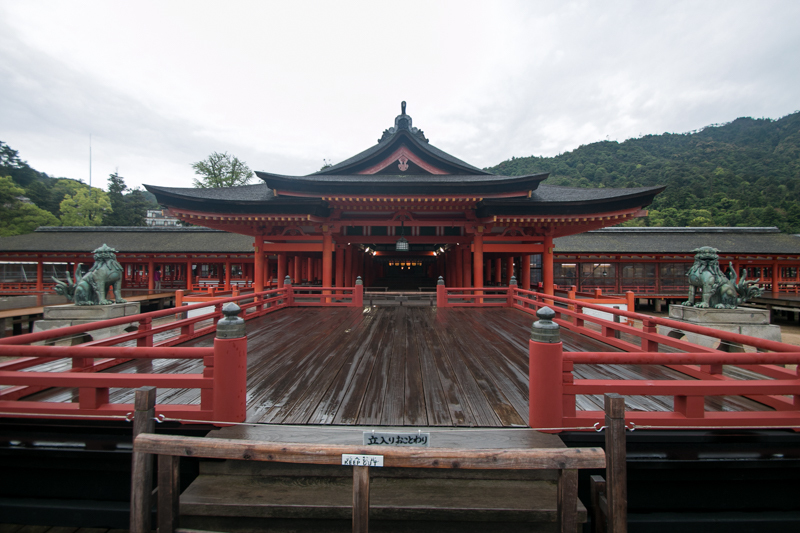 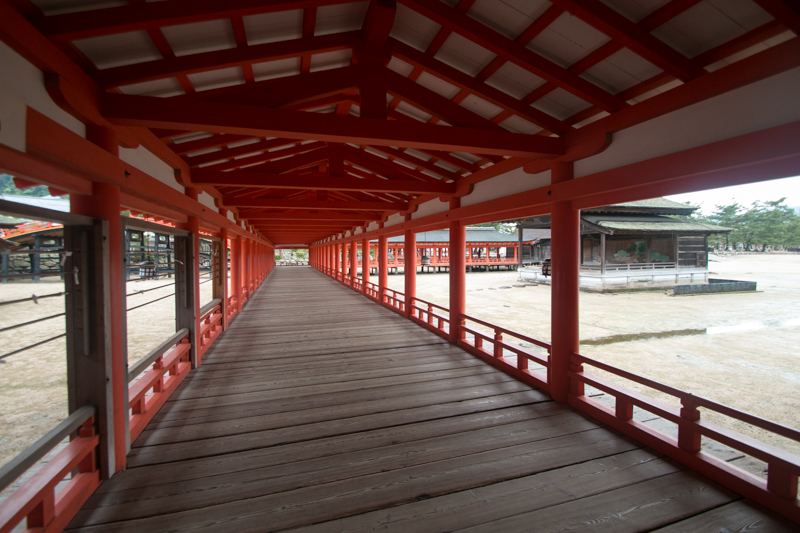 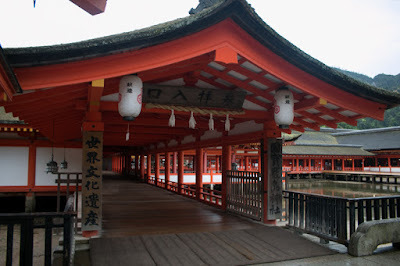 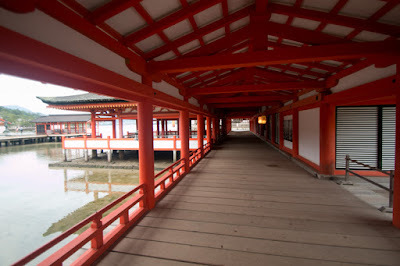 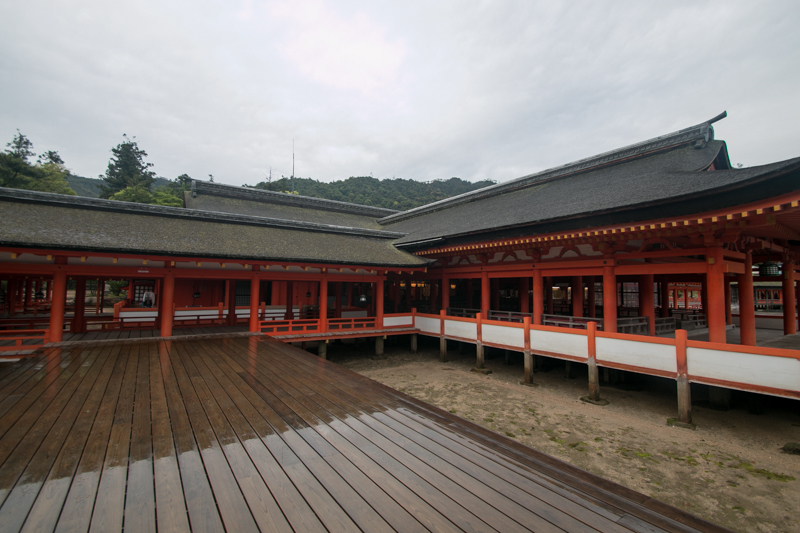 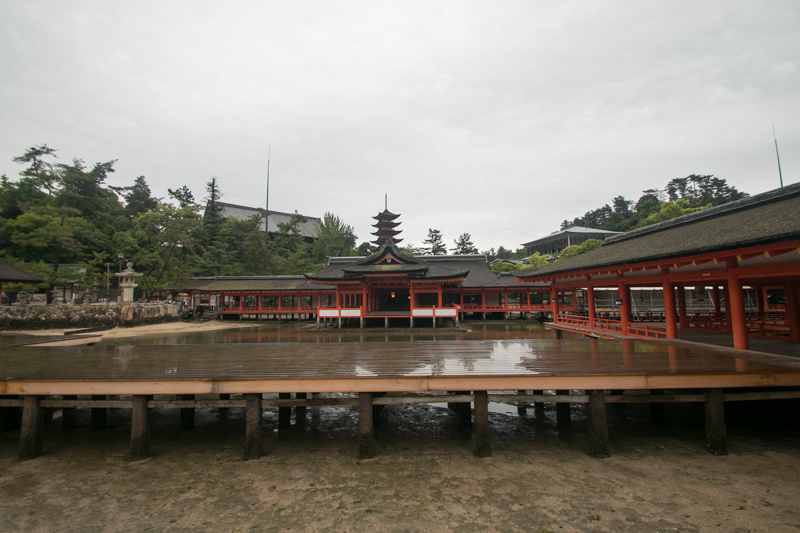 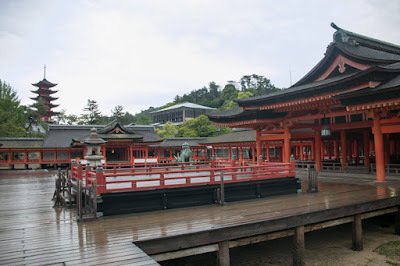 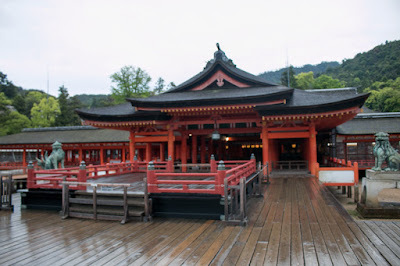 Itsukushima island is famous for Itsukushima Shrine which was significantly expanded by Kiyomori Taira (1118-1181), a military aristocracy of Taira clan and seized the authority in the middle of 12th century. 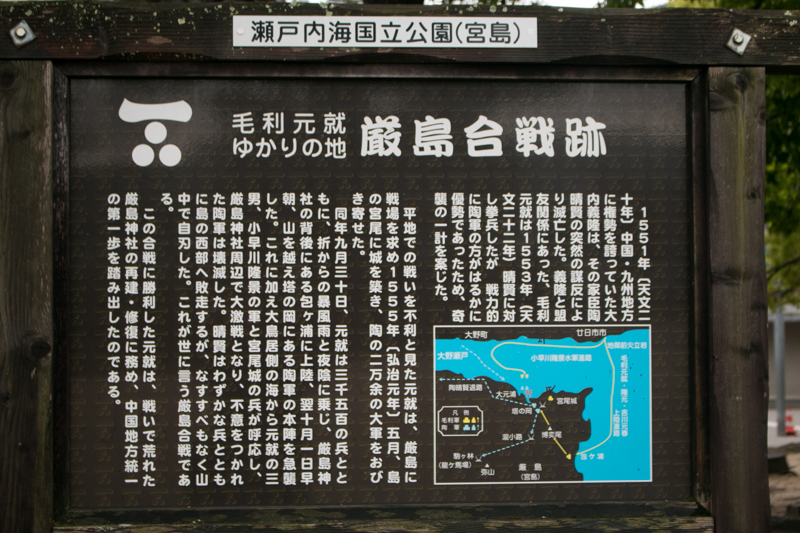 Kiyomori seized Setonaikai sea area and operated foreign trade toward Chinese Song Dynasty from Kinki region. 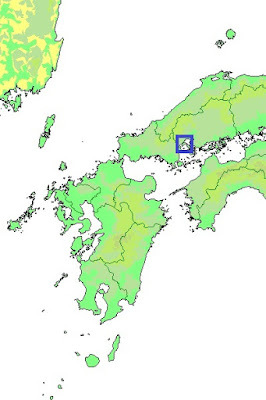 As current Hiroshima bay area was one of the important territory of Taira clan along with Hakata port, Kanmon straight and Hyogo area. 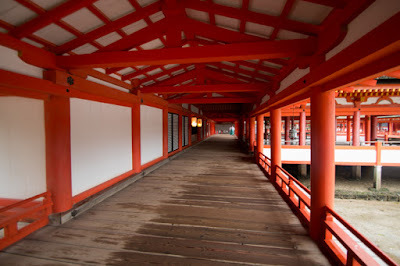 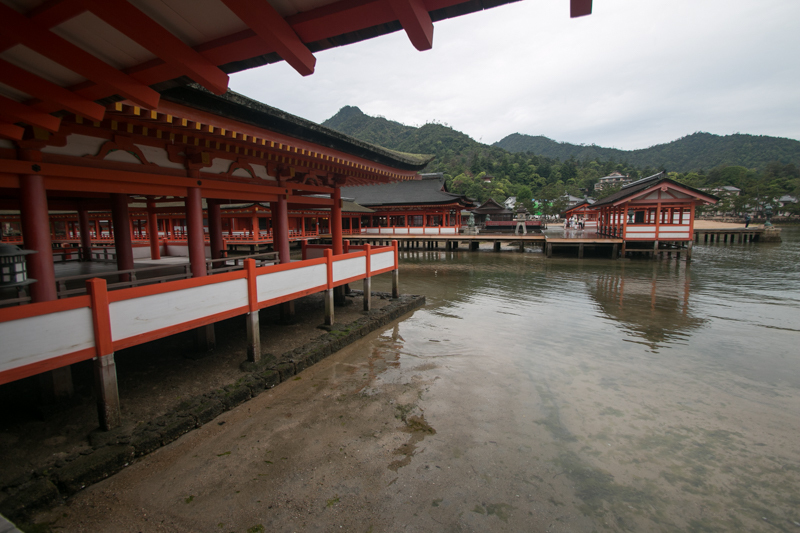 The narrow straight called as "Ono Seto" between Itsukushima island and main land was a good sailing route for trade ships, thus Itsukushima island was a good wall to protect ships. 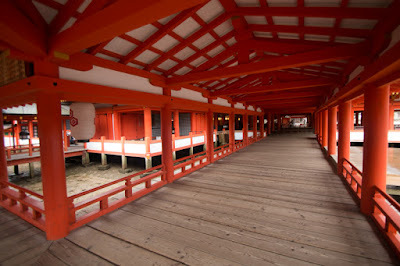 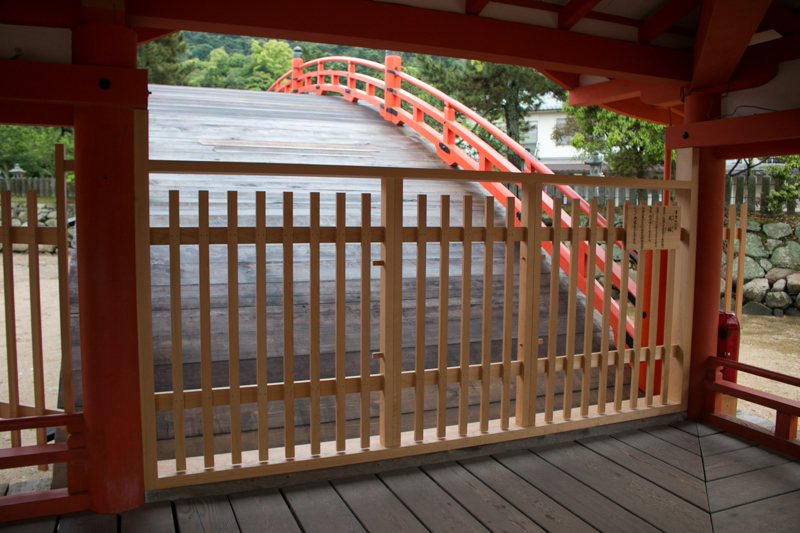 To hope their prosperity, Kiyomori built vivid red shrines and gate at seashore, which seems as if floating. 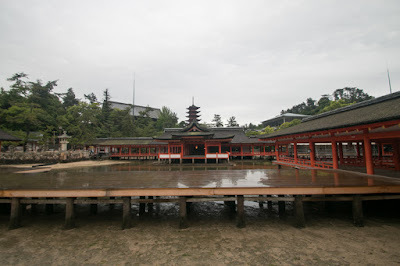 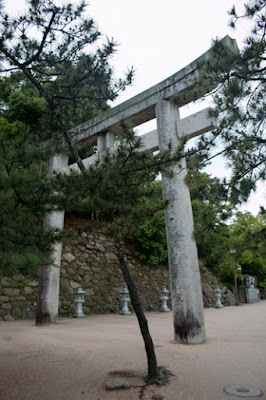 After the fall of Taira clan, Setonaikai sea was divided into local naval clan such as Murakami clan, and Itsukushima Shrine was one declined in Kamakura era. 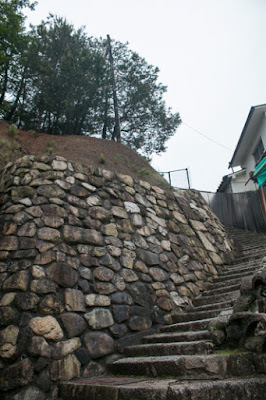 But in Muromachi era Ouchi clan which was the strong warlord of Suo province and Nagato province (Yamaguchi prefecture) again engaged in the trade with continent, and might build Miyao castle to keep their connecting point. 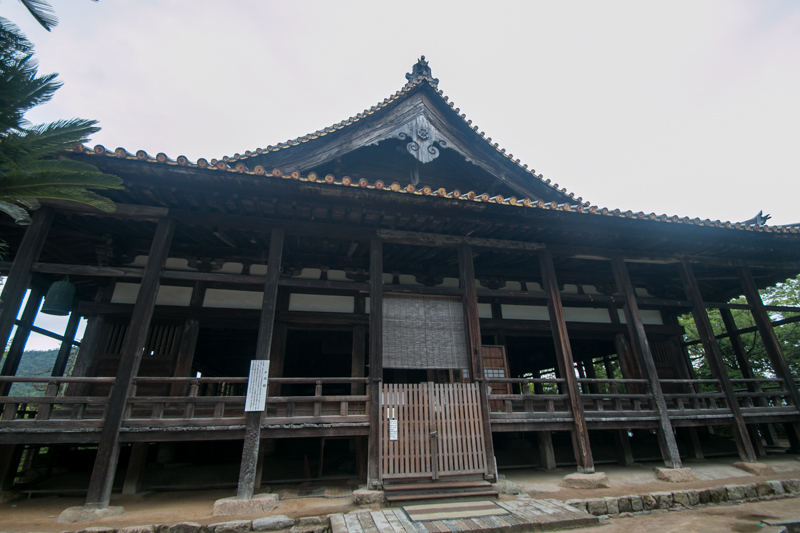 Based on the wealth gained from foreign trade, Ouchi clan became its peak period at the beginning of 16th century, and once marched to Kyoto region and built their own government. 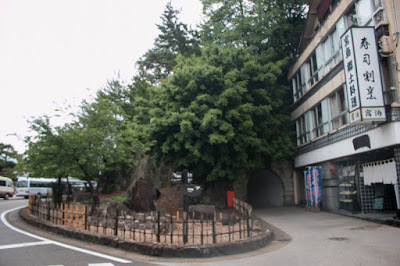 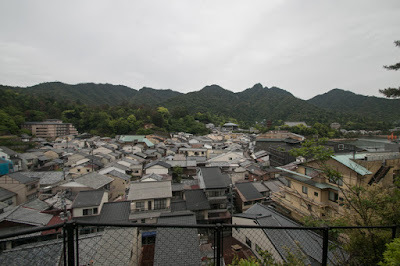 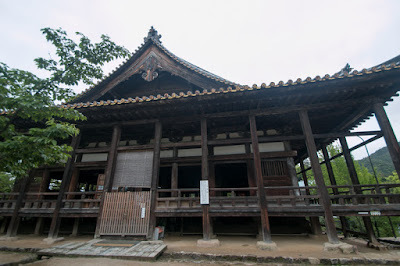 But burden for this excursion brought dissatisfaction between retainers and local lords, then Ouchi clan had to fought against Amago clan which left Ouchi clan and became an independent lord of Izumo province (Shimane prefecture). 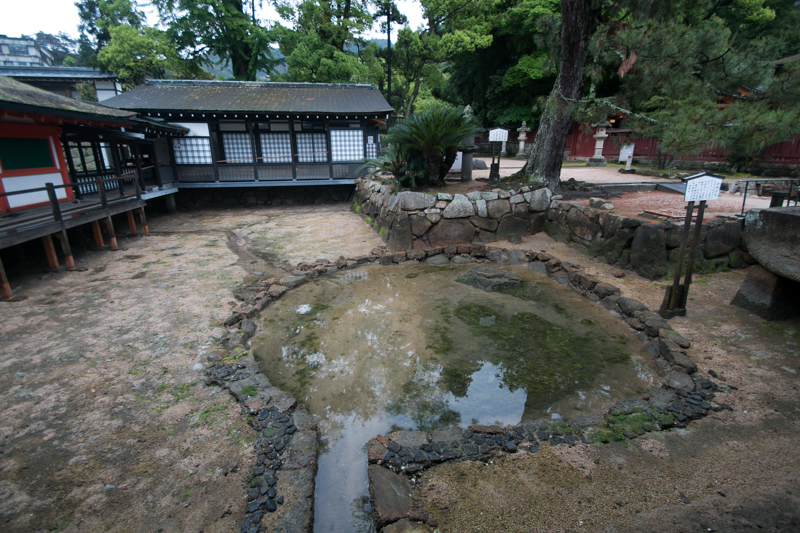 After the fail of the siege of Gassan Toda castle, which was the main base of Amago clan, Yoshitaka Ouchi (1507-1551) emphasized administrative staff such as Taketo Sagara (1498-1551), and indulged in cultural affairs. Harukata Sue (1521-1555), the highest general of Ouchi army at Suo Wakayama castle (Yamaguchi prefecture) who seized military power of the clan, was coldly treated and became conflict with Yoshitaka. 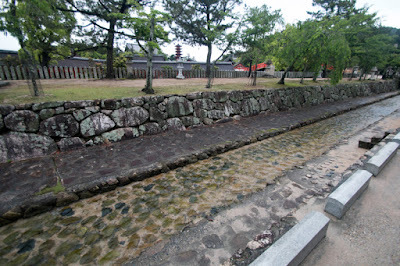 In 1551, at last Harukata Sue raised his army against Yoshitaka Ouchi. 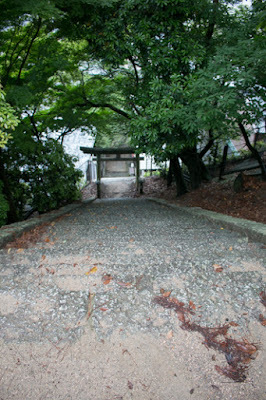 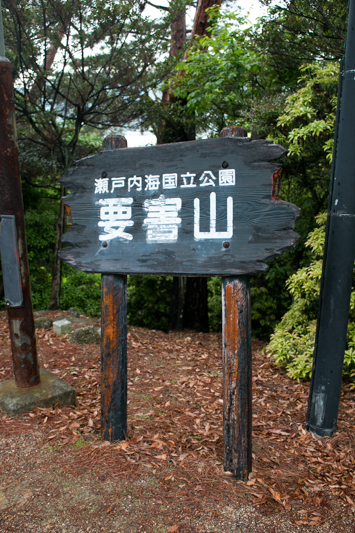 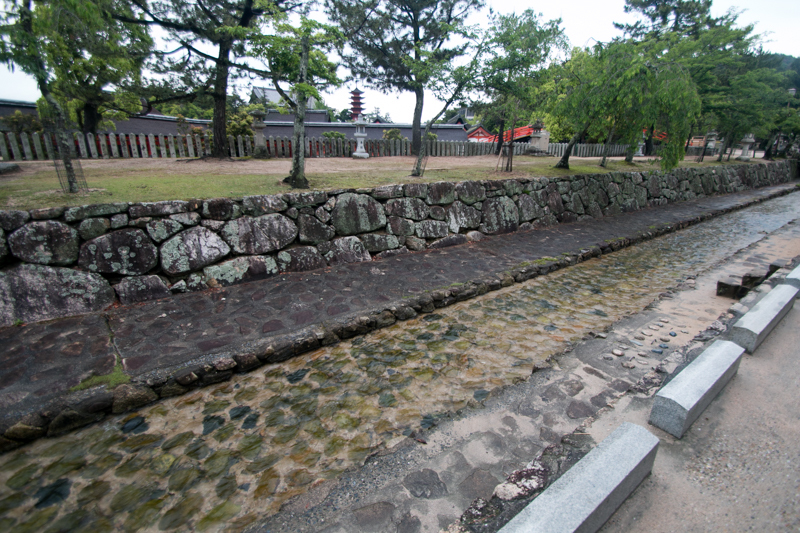 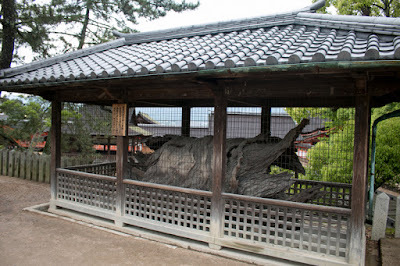 Yoshitaka could not gather his army then left its capital Nagato city, but failed to escape and killed himself at Daineiji temple of Nagato province. Harukata Sue placed nominal leader of Ouchi clan and virtually seized the authority. Harukata once succeeded in uplift but tried to centralize his authority then conflicted with other important retainers. Furthermore, Harukata also tightened economic control to naval clans such as Murakami clan or Kobayakawa clan and caused their antipathy. 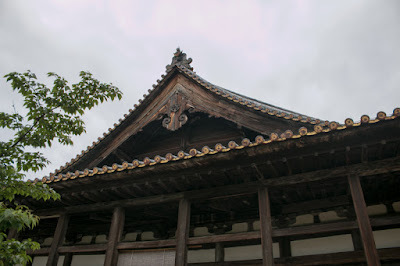 In 1554, Masayori Yoshimi (1513-1588), the lord of Tsuwano castle (Yamaguchi prefecture) and marital relative of Yoshitaka, raised his army against Harukata Sue. 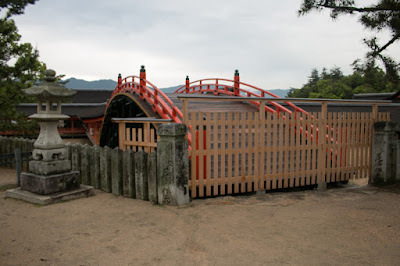 Motonari Mouri (1497-1571), who was still a small lord of Aki province (Hiroshima prefecture) resided at Yoshida Koriyama castle, at first belonged to Harukata and captured Ouchi side castles utilizing the incident. 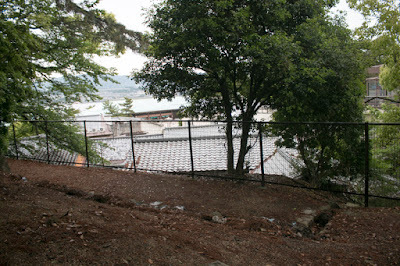 But Harukata Sue became cautious of growth of Mouri clan, then forced Motonari to participate in the siege of Tsuwano castle. It is said that Motonari intentionally supported Harukata Sue to ruin upper authority Ouchi clan, then beat Sue clan as a traitor then gain the overcame Ouchi clan without bad reputation. 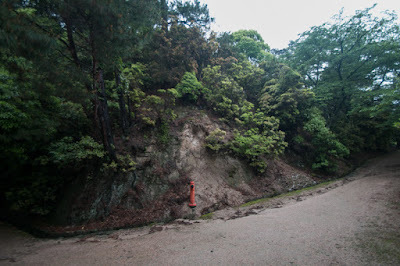 The result was exactly so but it is not clear if this story is true or not, as there are too many uncertainty on this plan. 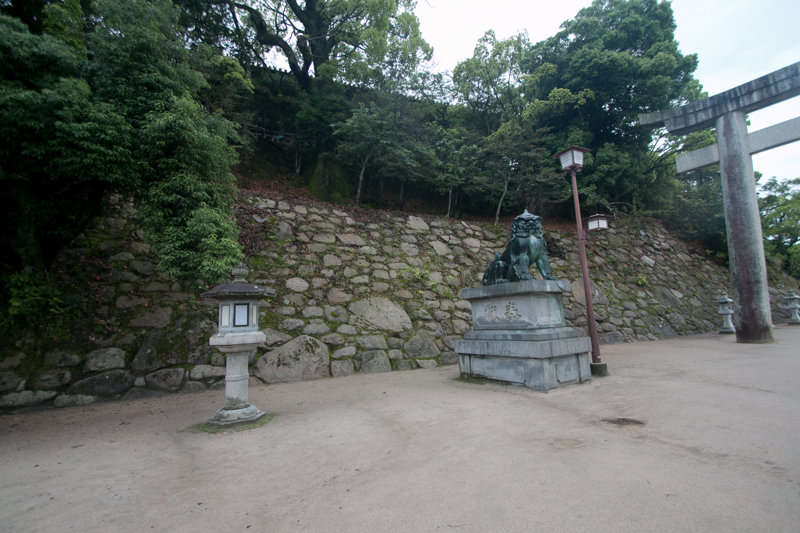 Anyway at last, Motonari decided to raise against Harukata Sue in 1555. Utilizing the absence of main force of Sue army at the siege of Tsuwano castle, Mouri army captured Sakurao castle and Itsukushima island, the entrance of Hiroshima plain from Nagato province which was the main territory of Sue clan. Looking at the raise of Mouri clan, Harukata sent small army lead by his general Fusanaga Miyakawa (?-1554) to Sakurao castle. But facing the sudden attack of Mouri army, Sue army suffered severe defeat and Fusanaga died in the battle. 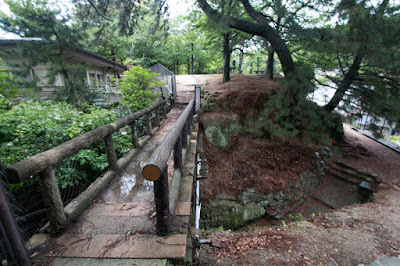 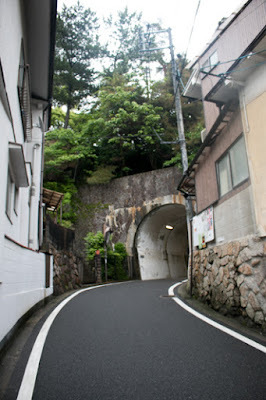 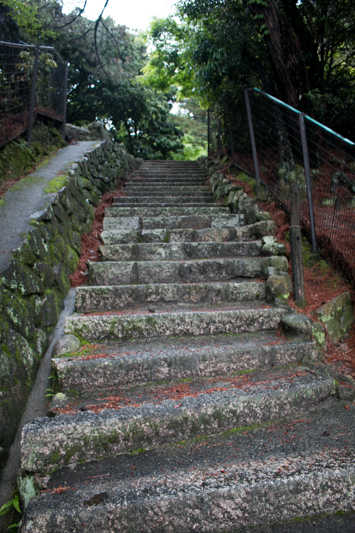 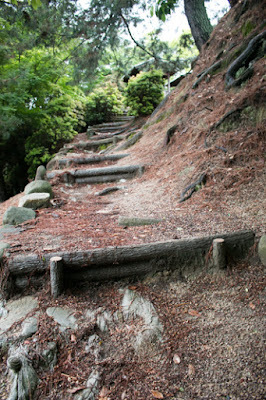 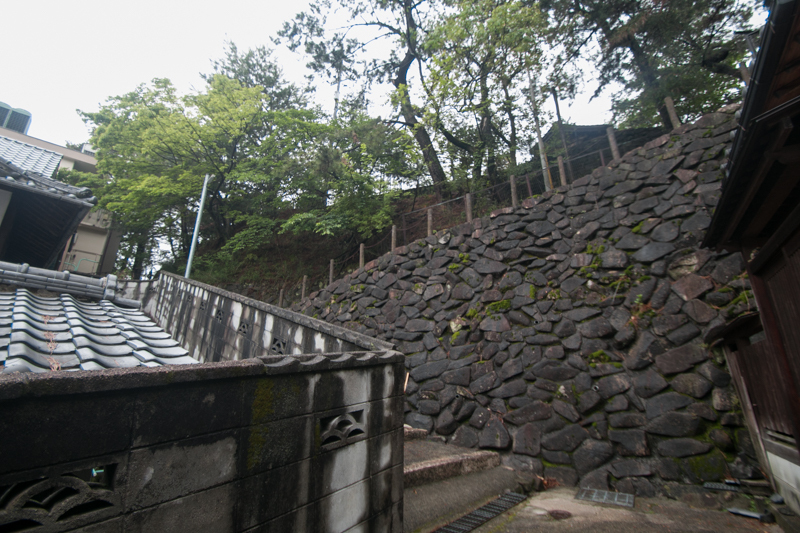 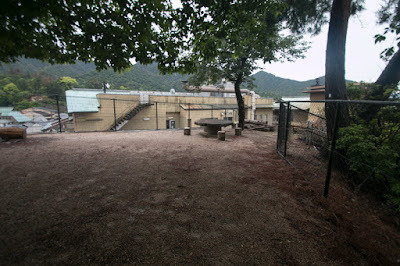 Motonari gained time for preparation and strengthened Miyao castle. Miyao castle is built utilizing a small ridge spreads westward from backside mountain. The terrain is significantly changed by later development, but rough shape of castle is barely grasped by the undulation of terrains. 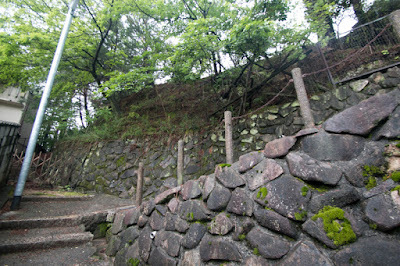 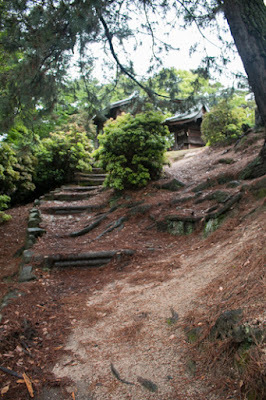 The main part of the castle is a long and narrow ridge has two terraces connected by narrow path. 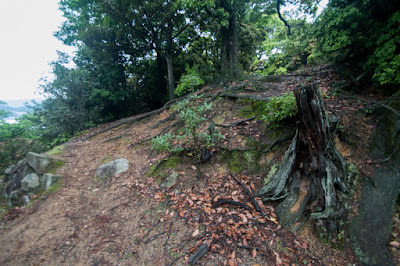 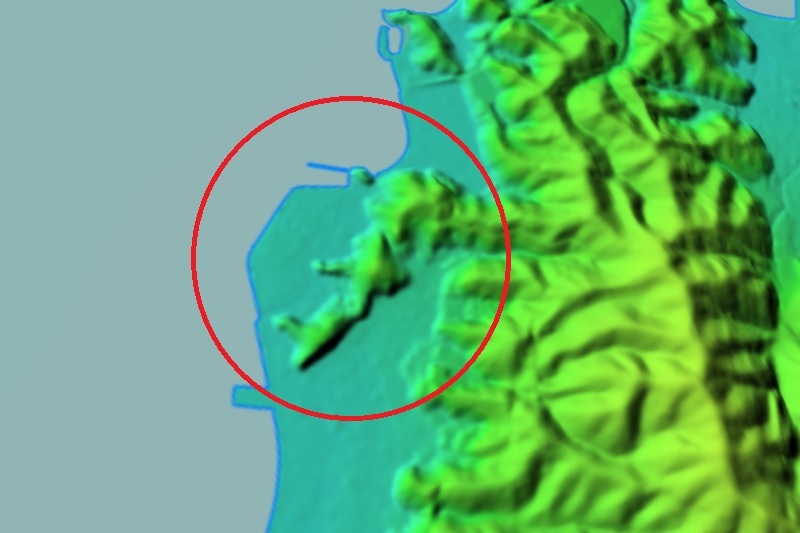 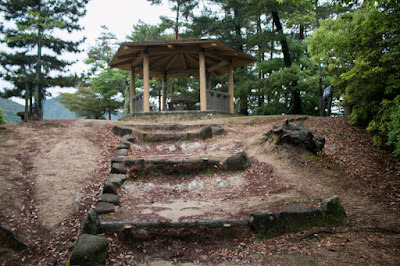 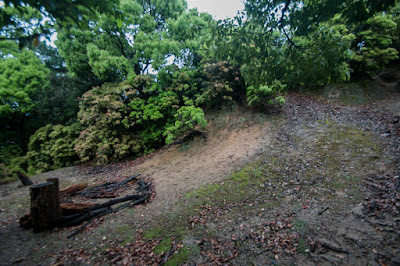 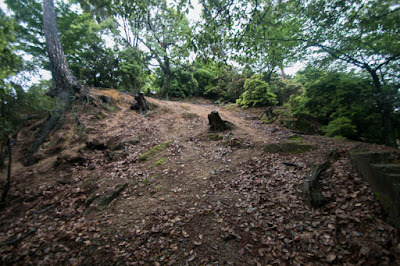 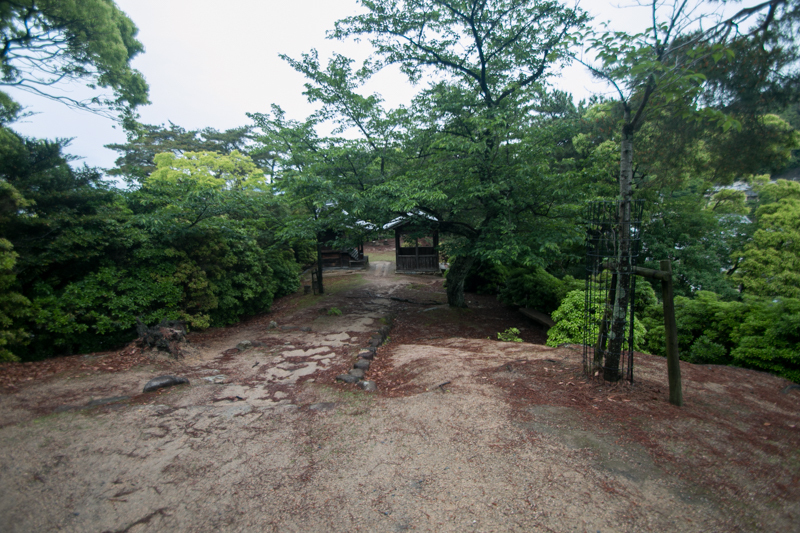 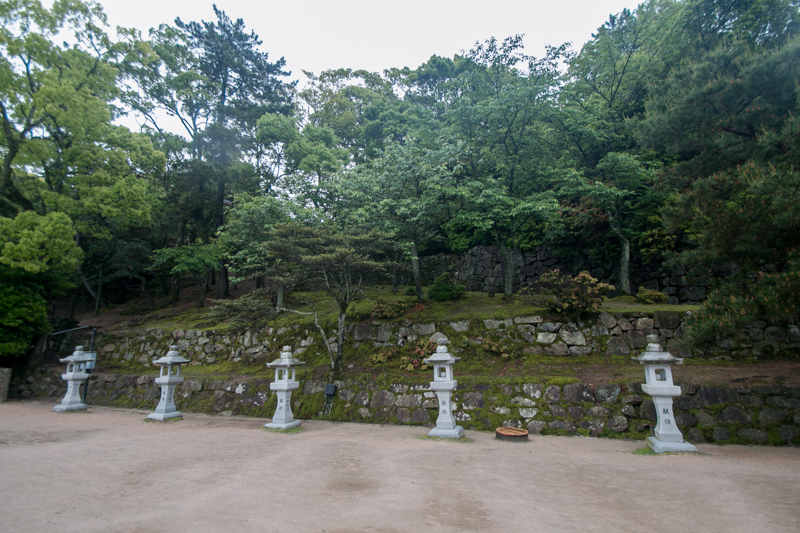 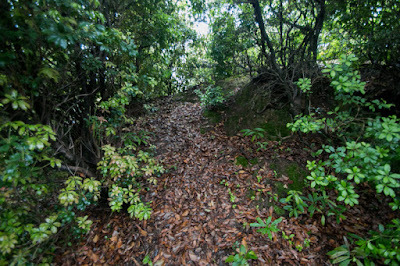 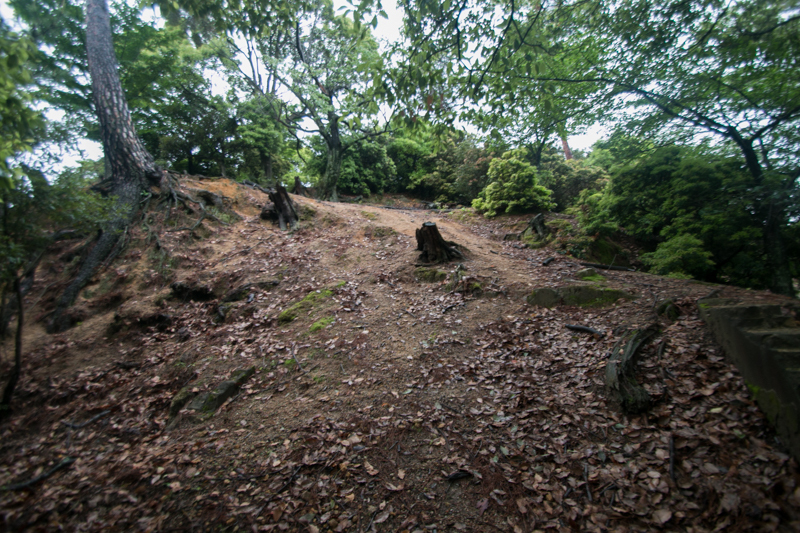 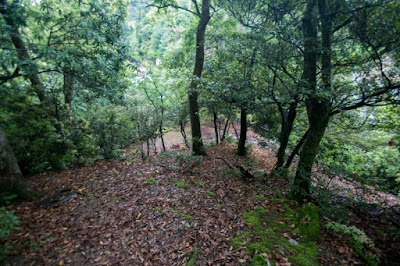 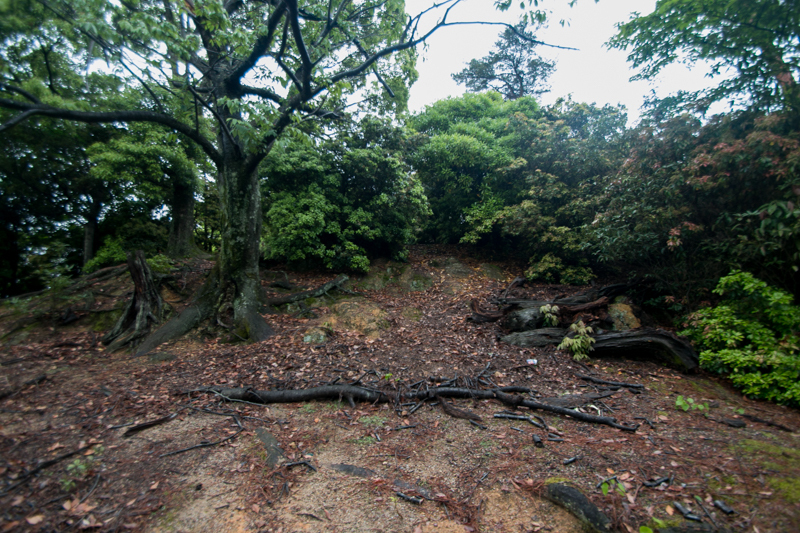 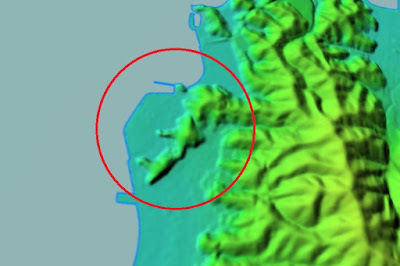 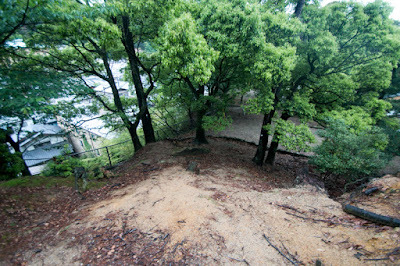 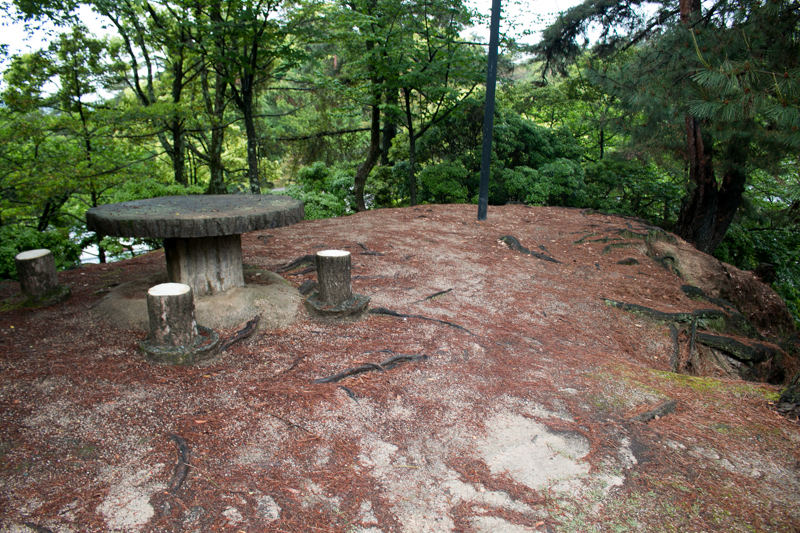 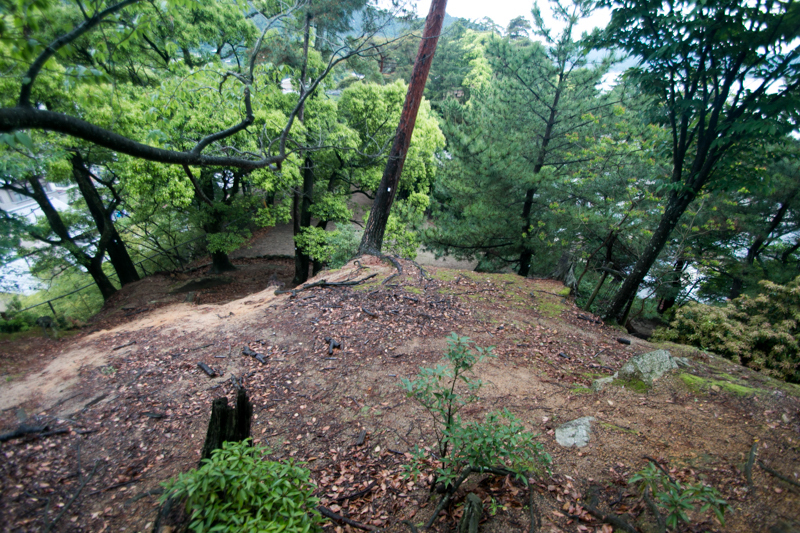 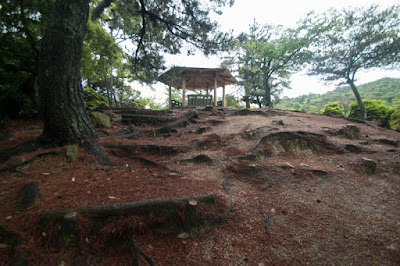 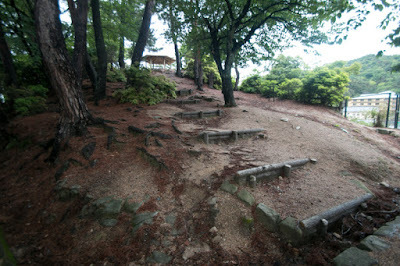 The upper one which is a round shaped hill might be a central area of the castle, and lower one which is used as a ground of shrine could be the secondary area..
At the northeast of this part ahead of a saddle point might be used as a dry moat, there is a higher peak covered by woods. 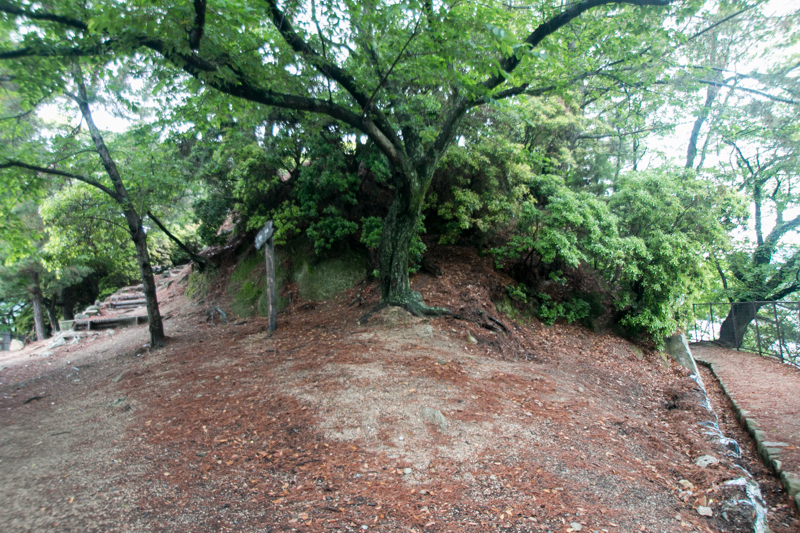 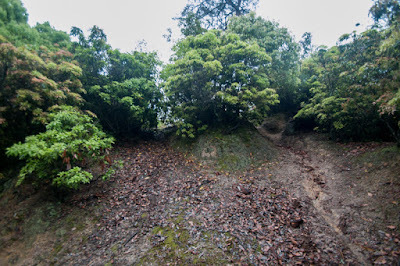 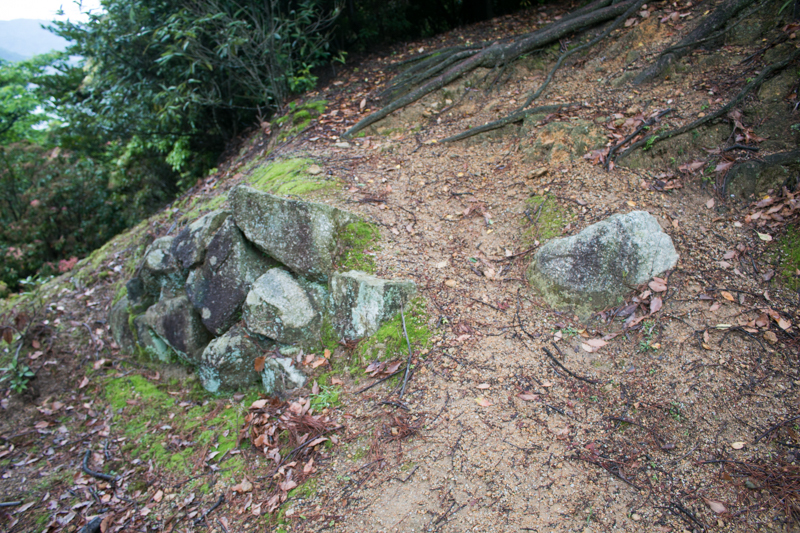 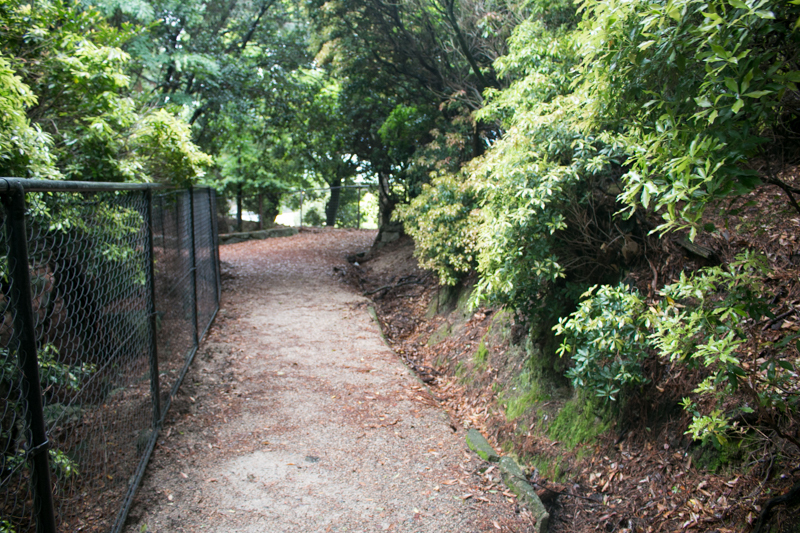 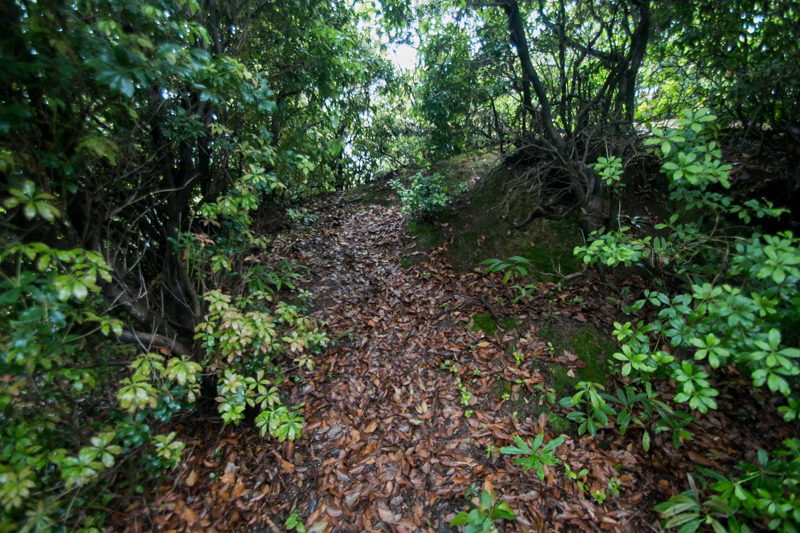 This part might be used as a front side fort which is separated from backside hills by dry moat, to prevent the attack from higher place to central area. Including this part, total size of the castle might be 300 meter long and 50 meter wide. 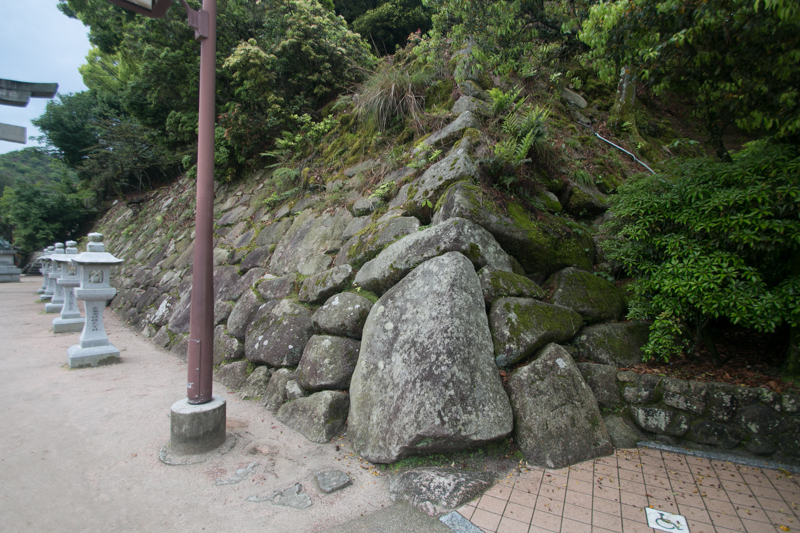 To compete with overwhelming Sue army, Motonari made every effort. At first Motonari tried to lure Fusahide Era (1515-1555), an important general of Harukata who activated at many general. 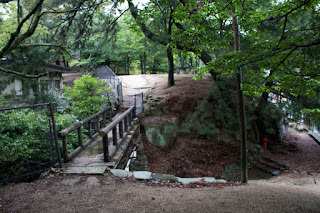 It is unknown if Fusahide accept this or not, but Harukata purged Fusanaga because of the suspect of betrayal. Motonari could decrease the army of Harukata and also deprive the morale of soldiers. Motonari also let his important retainer Motozumi Katsura (1500-1569) who became the commander of Sakurao castle to make fake betrayal to Harukata. Motozumi made seven oaths to Harukata, and also recommended Harukata to cross the straight and siege Miyao castle, as Motozumi blockade the straight and encircle Mouri army to the island. 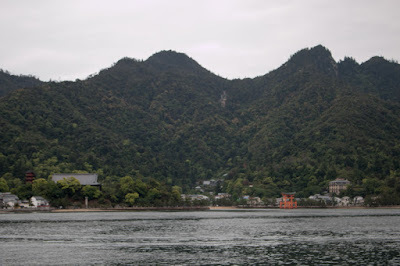 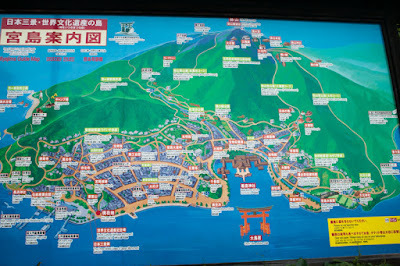 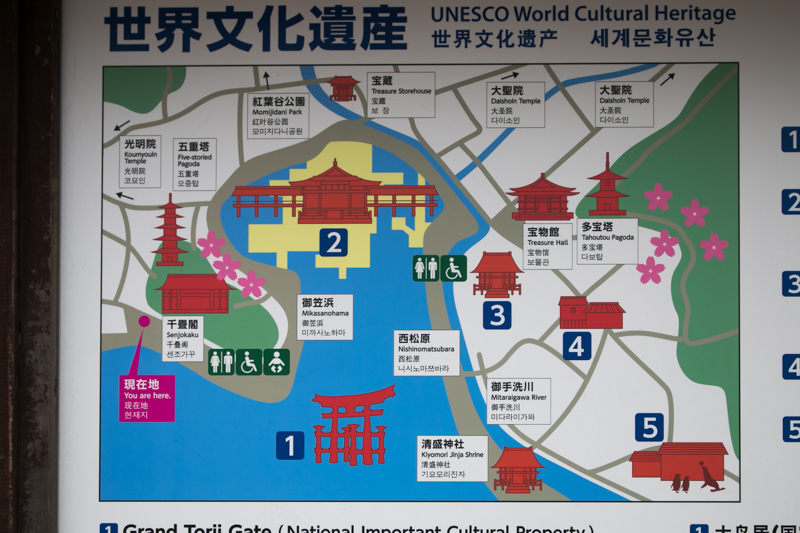 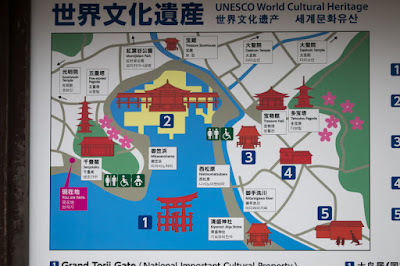 It is said that this was a trap of Motonari to lure the overwhelming army to Itsukushima island that has quite limited flat space and not suitable for the operation of large army. 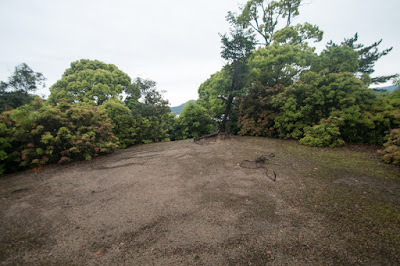 Irrespective to the trustworthy of this story, Sue army had to fall Miyao castle before the invasion of Hiroshima basin which was able to obstruct the supply line of Sue army at backward. 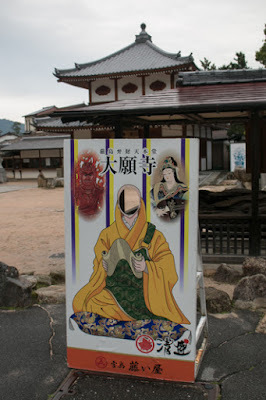 Takakane Hironaka (1521-1555), a talented general of Harukata who knew the intelligence of Motonari tried to stop the cross of Harukata himself, but Harukata was hot-blood and might feel the necessity of short-term settlement because of the fear of another betrayal from the plot of Motonari. 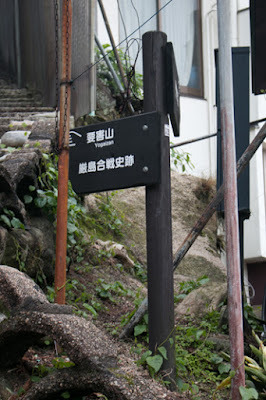 Takakane Hironaka expected his death but accomplished with his master. 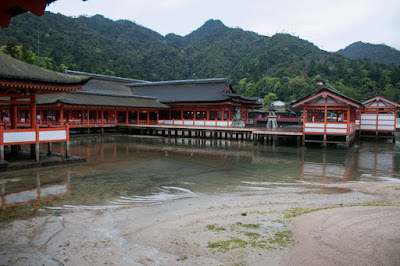 In September, Harukata Sue who once made peace with Masayori Yoshimi lead large army and landed to Itsukushima island. 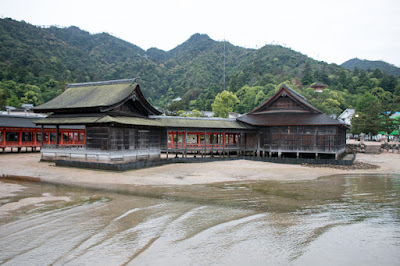 Harukata placed his camp at the backward of current Itsukushima shrine, and encircled Miyao castle with about 10,000 soldiers. Miyao castle had only 500 soldiers but securely protected it for one week by arrival of Mouri army. Looking at the landing of Sue army, Mouri army also headed to the opposite shore of Itsukushima island with 4,000 soldiers. 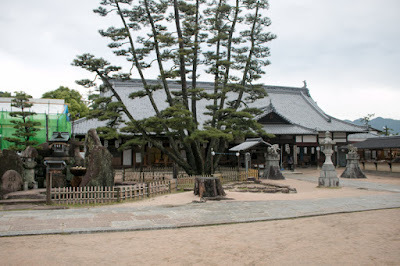 After negotiation of Takakage Kobayakawa (1533-1597), the third son of Motonari and leader of Kobayakawa navy, Murakami navy which had antipathy to Sue clan finally decided to support Mouri clan. 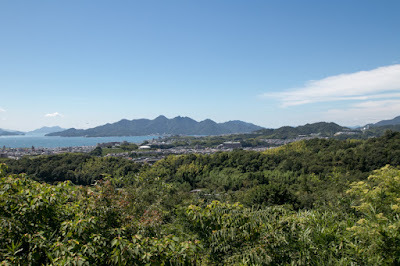 Under the support of Murakami navy, main force of Motonari Mouri army rounded to the eastern shore of the island utilizing heavy storm and climbed to the peak at backside of Sue army. 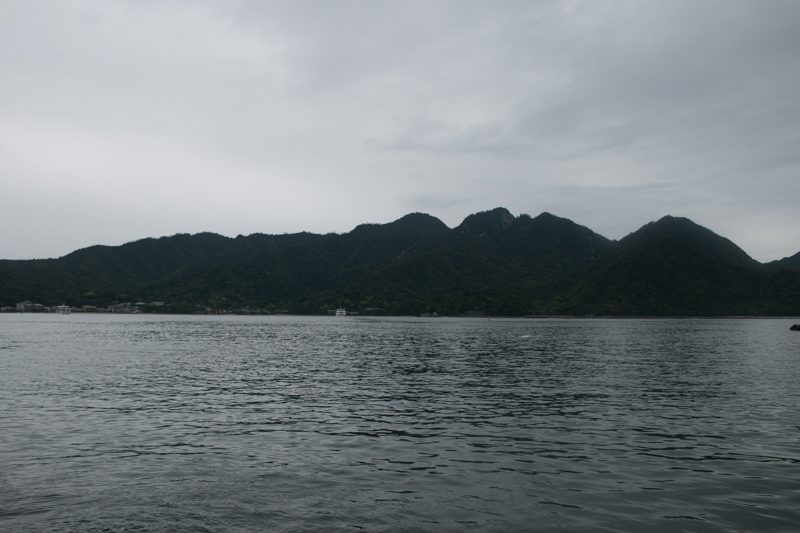 On the other hand, Kobayakawa navy and Murakami navy waited on the sea. 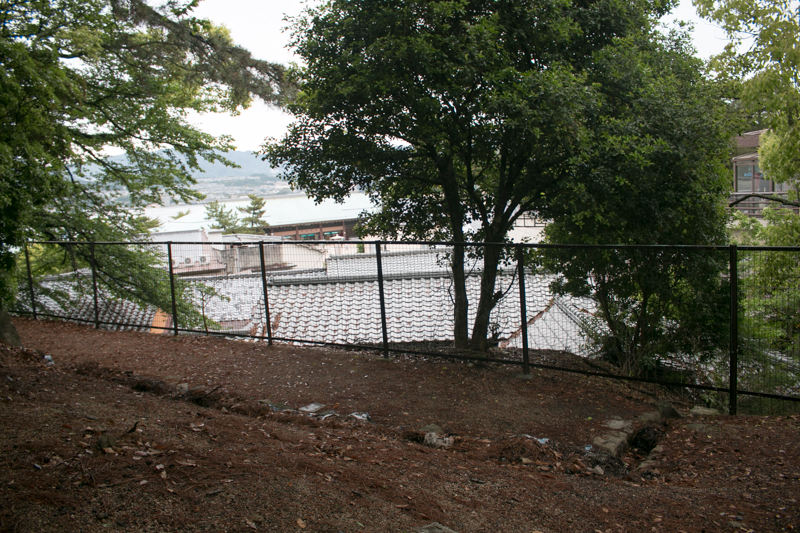 Next early morning Mouri army suddenly assault Sue army from higher place. 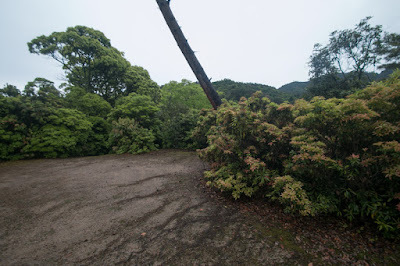 As there is no abundant space, Sue army became disorder and could not restore the situation. 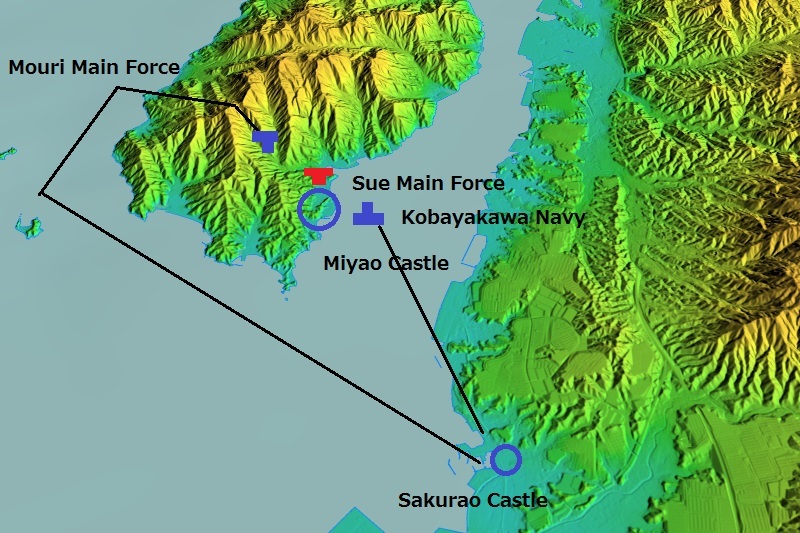 Sue army tried to retreat from the island, but at this time Kobayakawa navy and Murakami navy burnt all of Sue ship at the landing point. 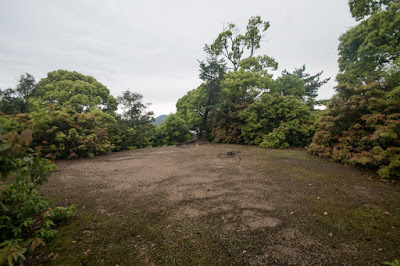 Takakane Hironaka who might expect the sudden attack and kept his troop at higher place bravely fought against Mouri army and let Harukata escaped from battlefield. Harukata seek the ship to cross the straight but could not, then finally killed himself at the seashore. 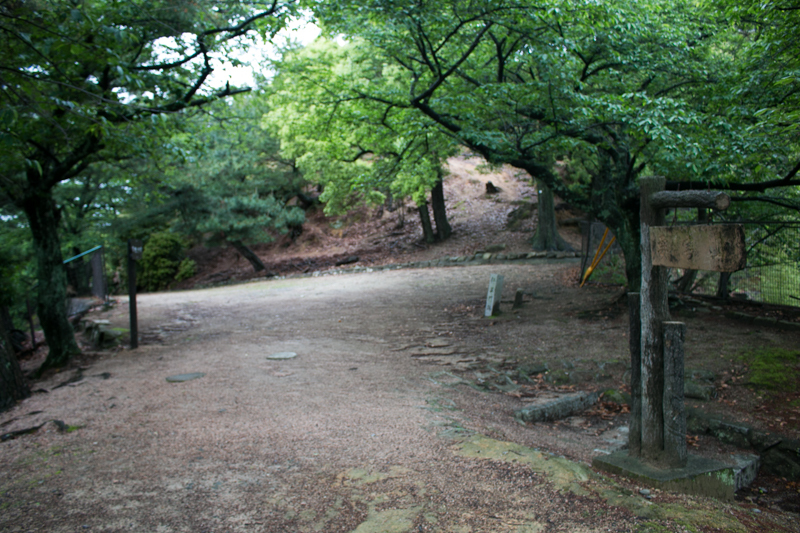 Takakane kept resistance at the top of the mountain but finally died in the siege of Mouri army. This battle of Itsukushima is known as one of two battle in which inferior side broke overwhelming enemy, along with the battle of Okehazama occurred in 1560. 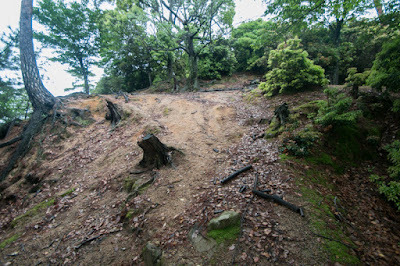 It is common that the weak side selected suitable battlefield, and utilizing the opportunity such as weather condition broke the main force of enemy at once. For losers side, the lord himself too much protruded, and lacked flexibility because of large army. 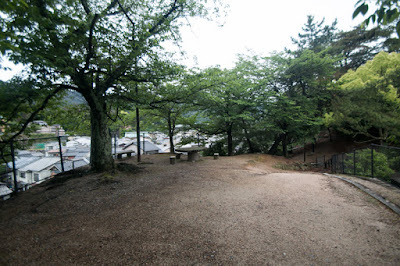 After the battle, the situation of Mouri clan and Ouchi clan totally reversed, and Motonari started invasion to former Ouchi territory. 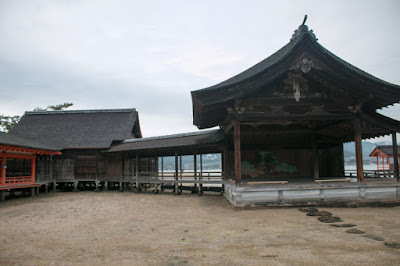 But Ouchi clan still kept soldiers unused at the battle of Itsukushima, and it took over two years to completely ruin Sue clan and Ouchi clan. 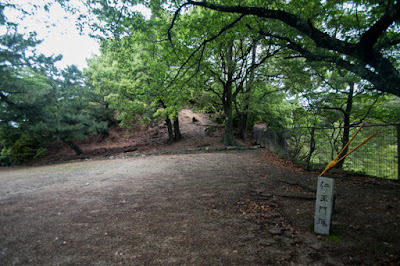 In 1557, Yoshinaga Ouchi (1532-1557) who was placed as a leader of Ouchi clan by Harukata Sue killed himself at Katsuyama castle with the surviving son of Harukata Sue, and long battle between Mouri clan and Sue clan ended. 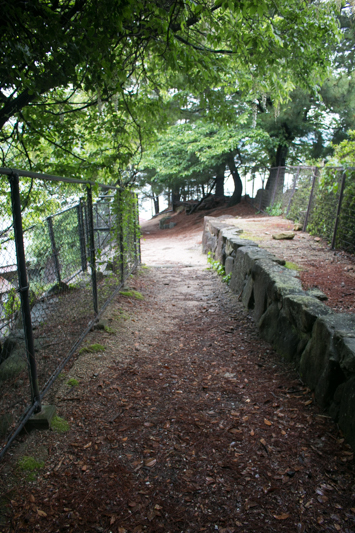 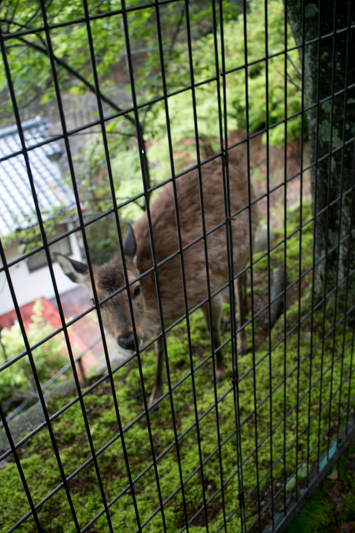 Now castle ruin quietly stands in Miyajima town, at the next of crowded Itsukushima Shrine. 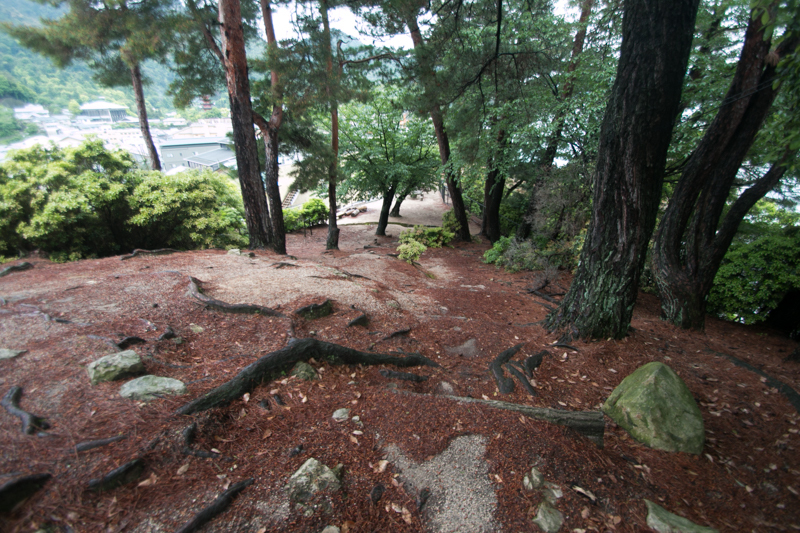 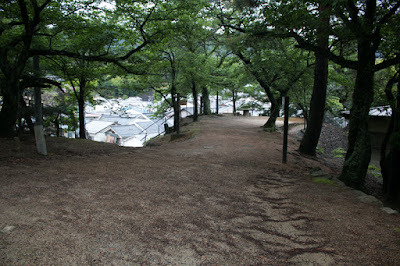 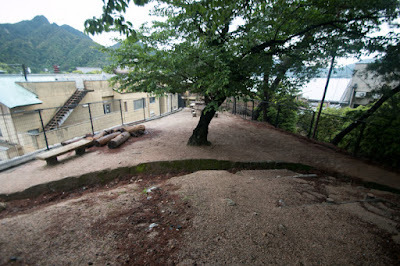 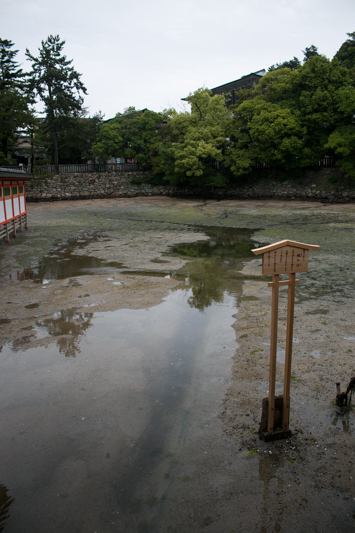 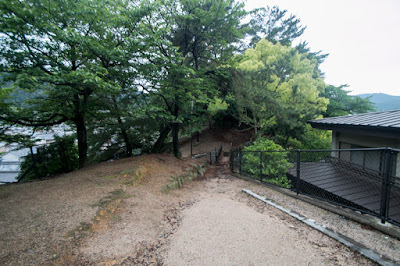 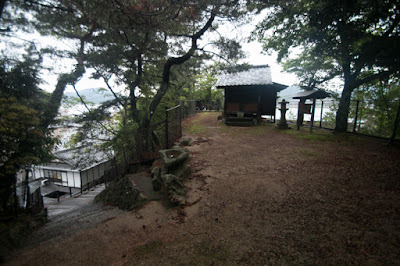 From castle site whole shape of small flat space of sea shore between the castle and Itsukushima Shrine is well seen. This scenery reminds the preciseness of the tactics of Motonari to lure Sue army to this point, and careful plots to move the enemy to follow his plot. 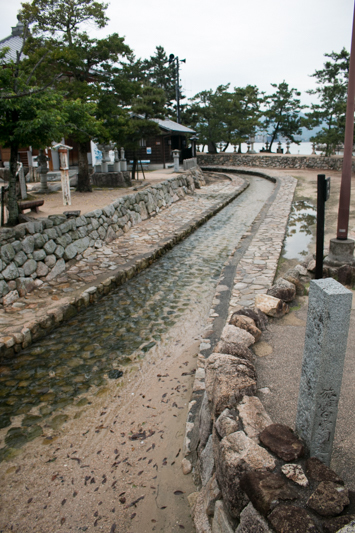 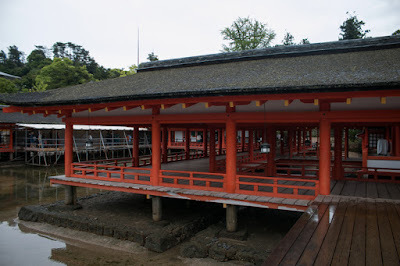 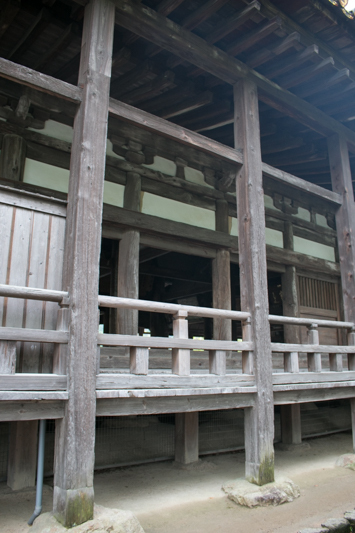 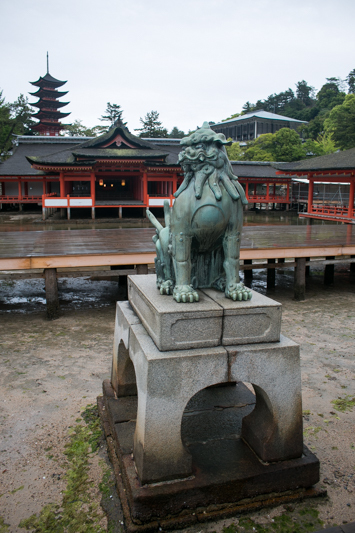 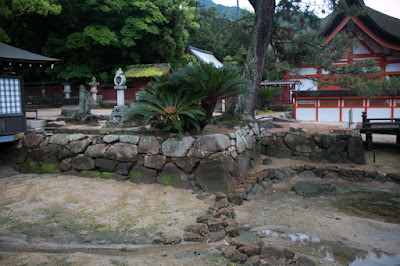 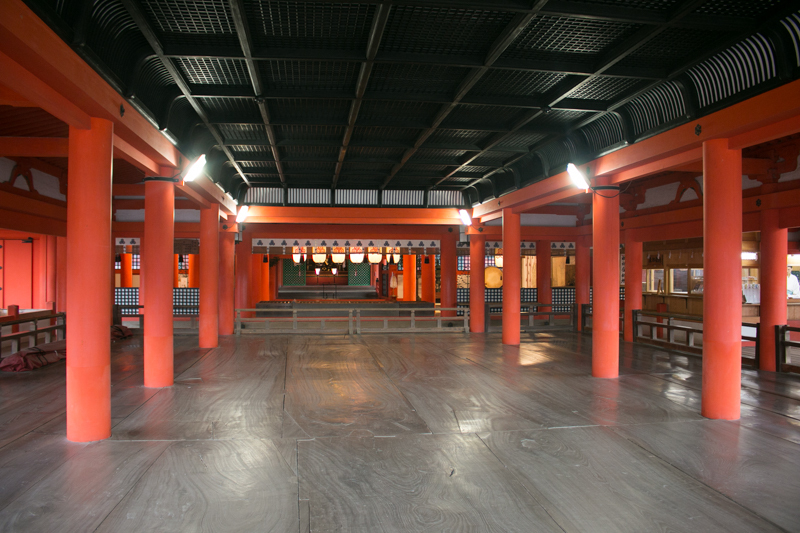 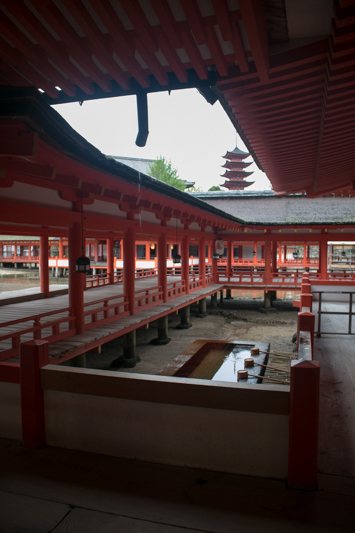 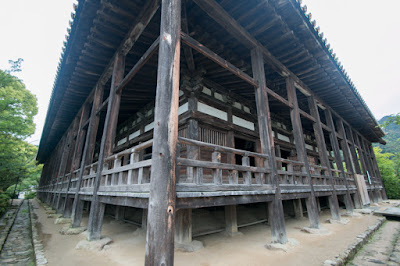 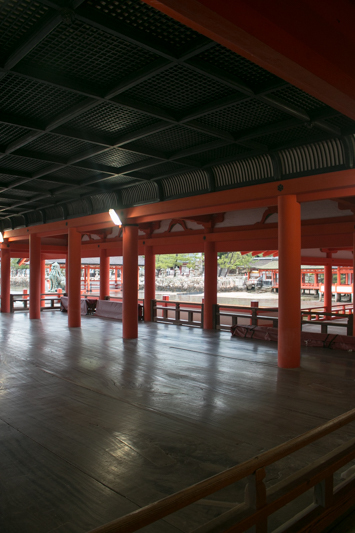 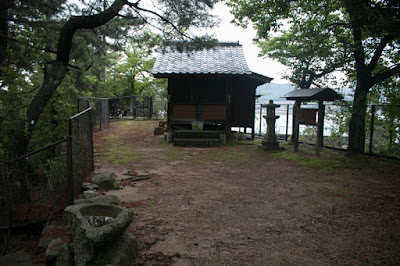 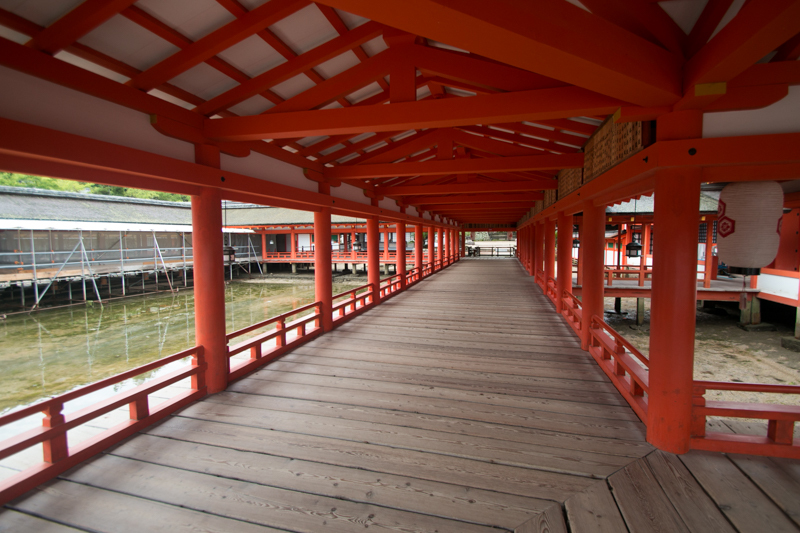 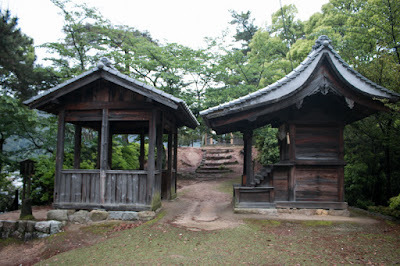 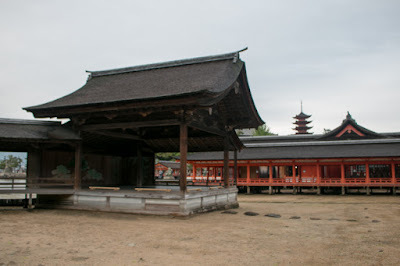 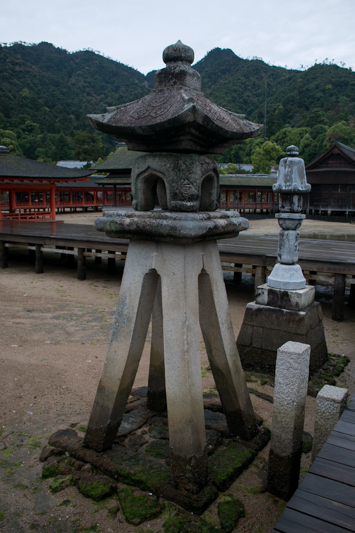 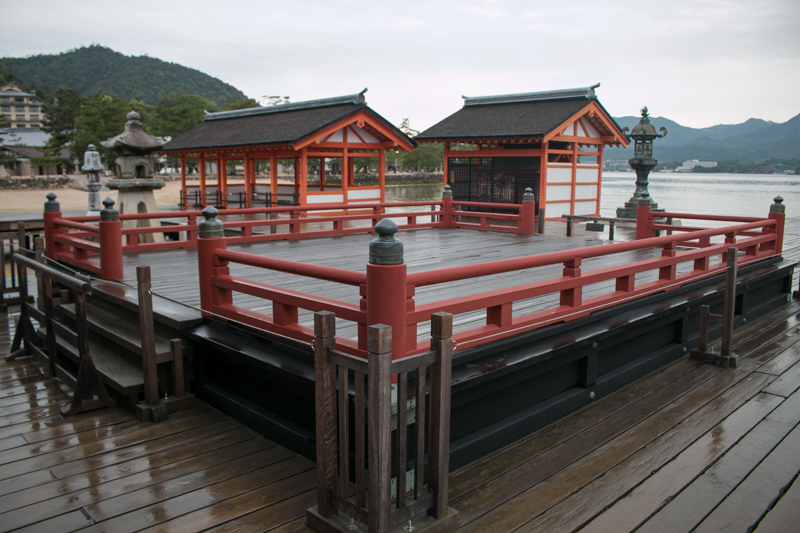 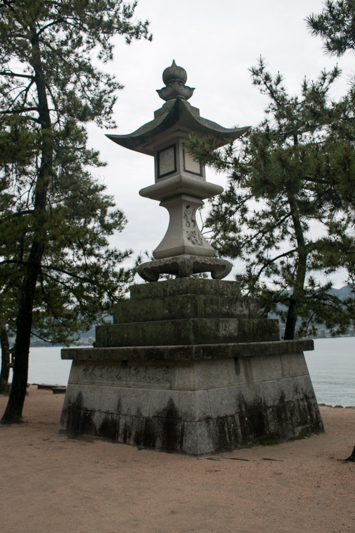 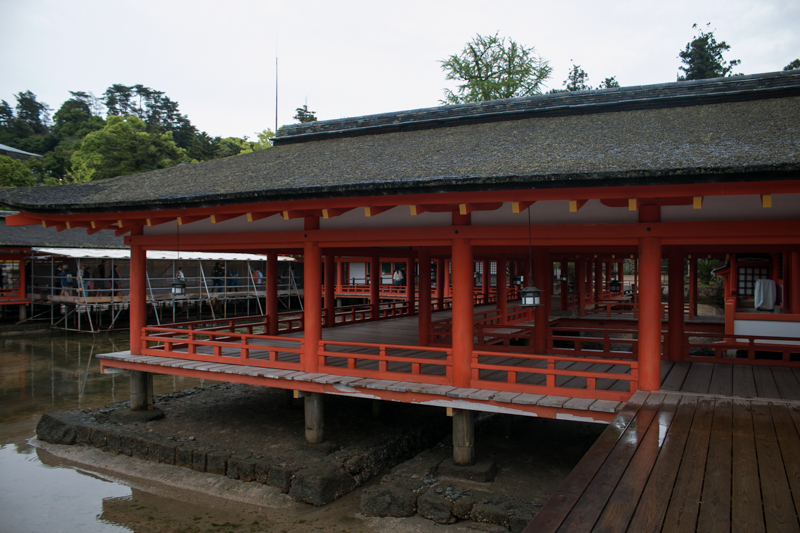 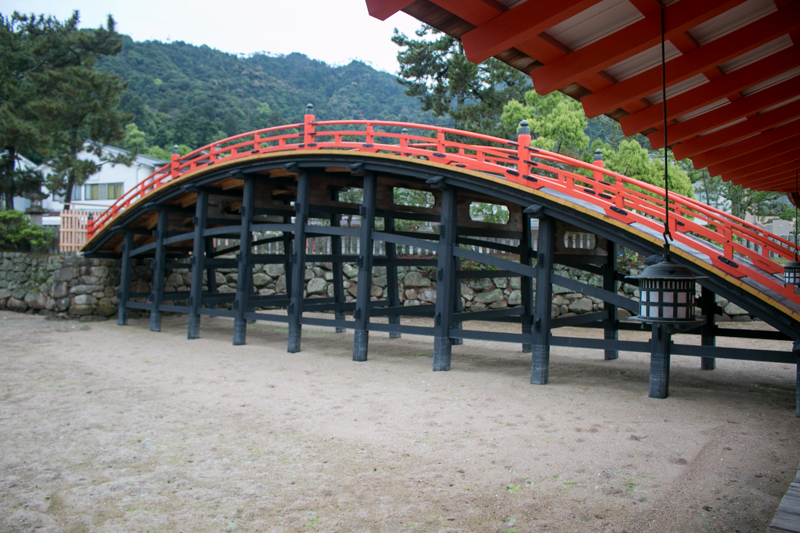 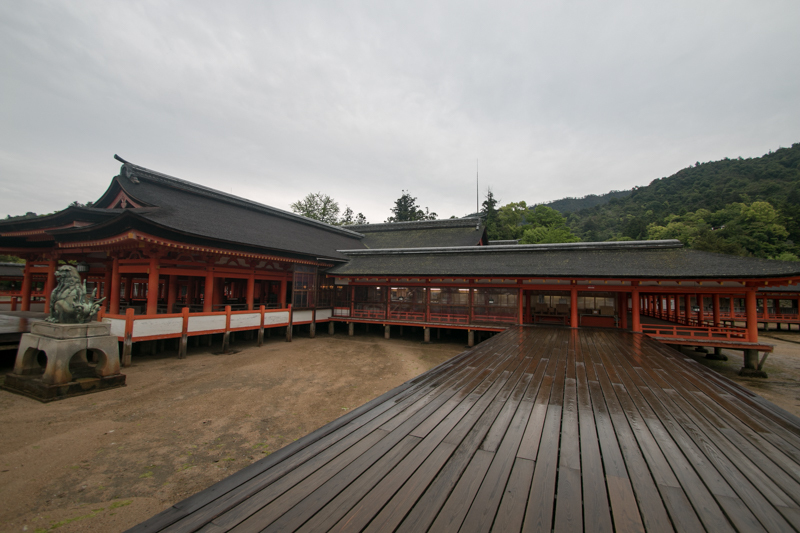 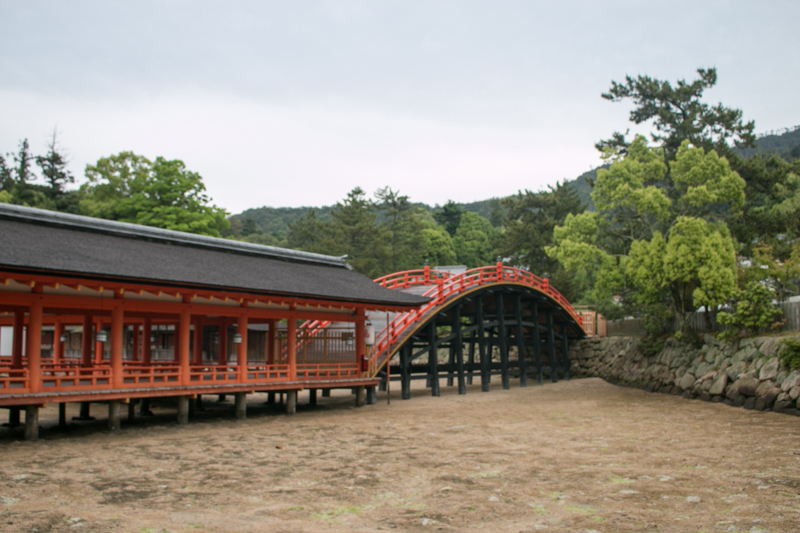 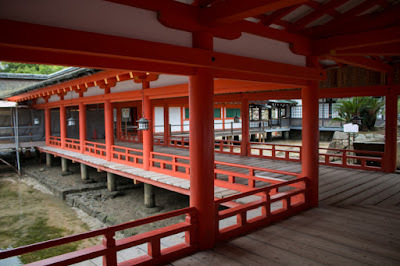 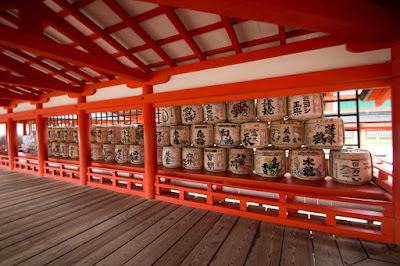 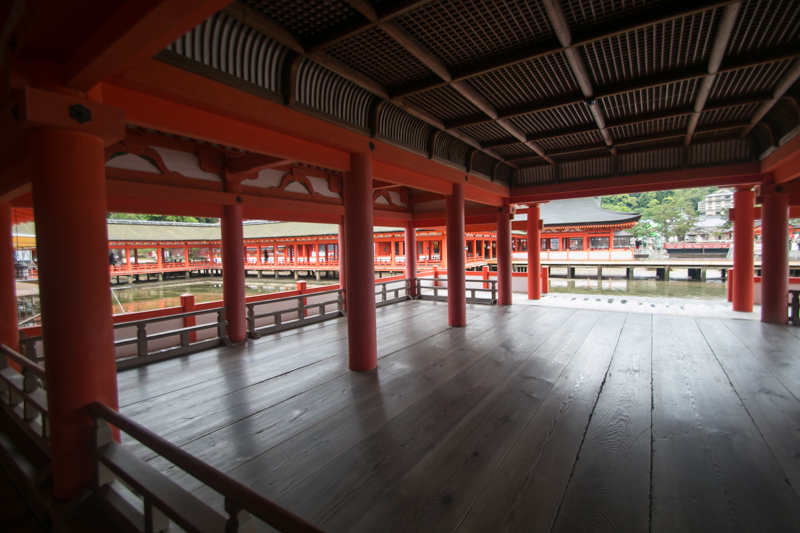 Later Mouri clan donated splendid buildings remain until today to Itsukushima Shrine, and this shows significant importance of the battle to the clan. 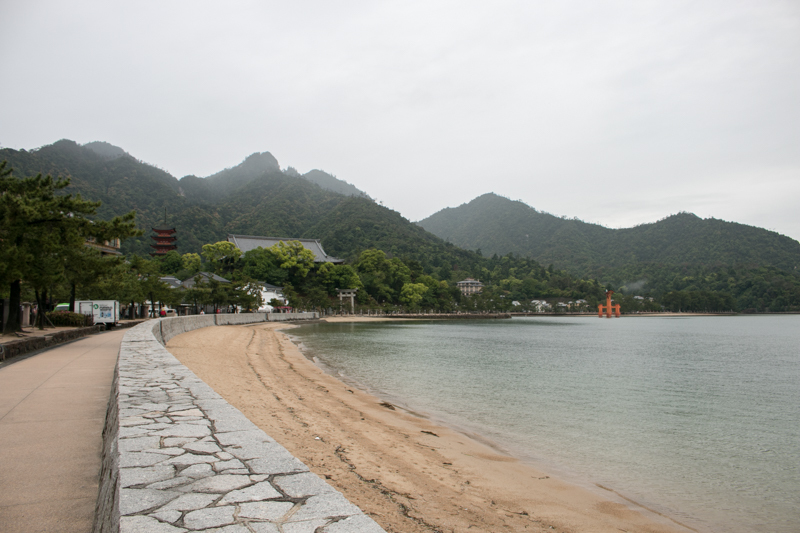 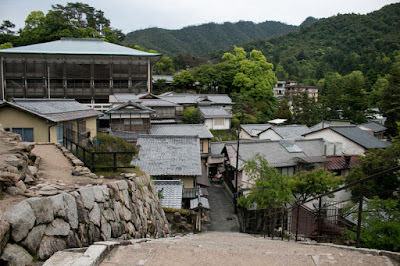 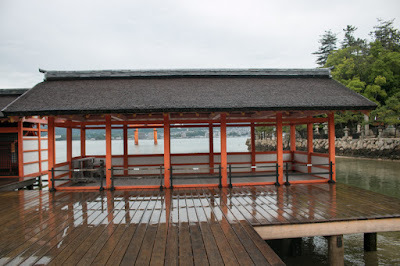 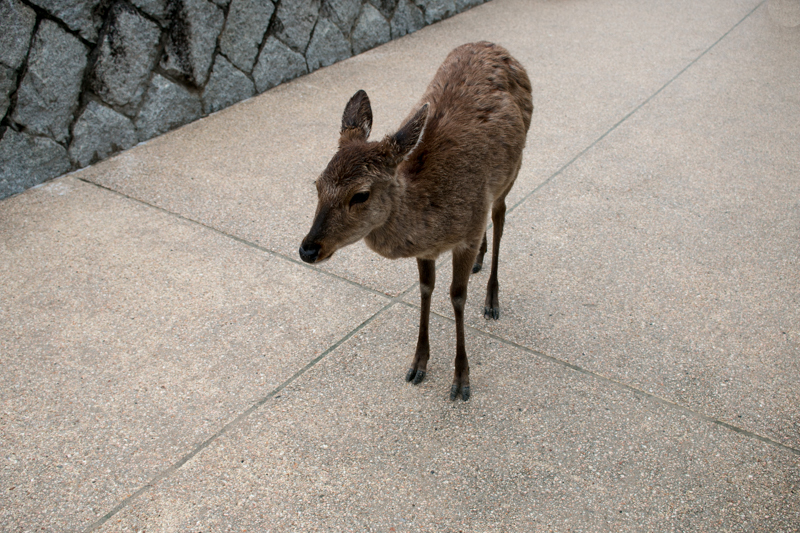 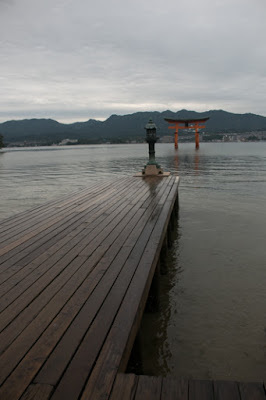 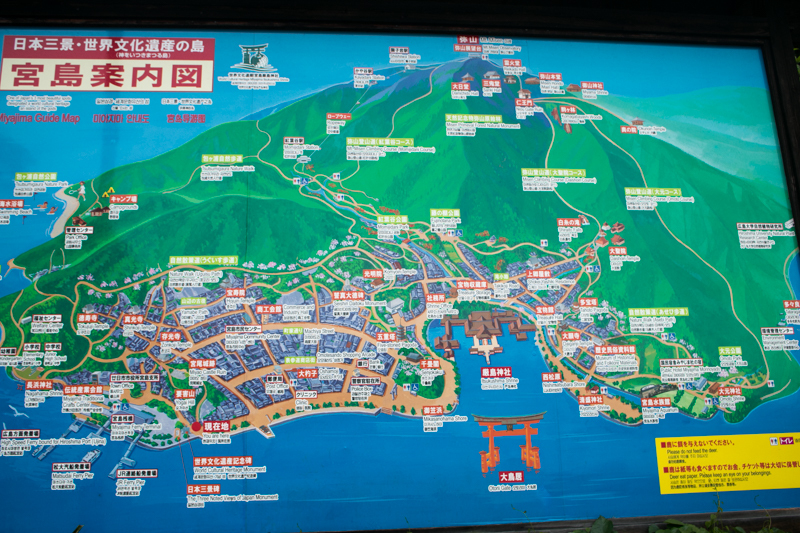 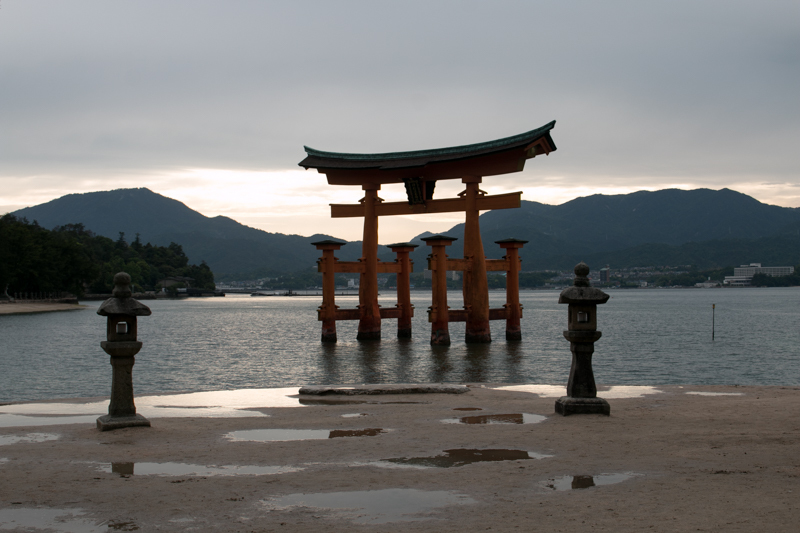 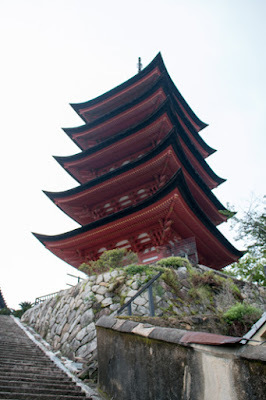 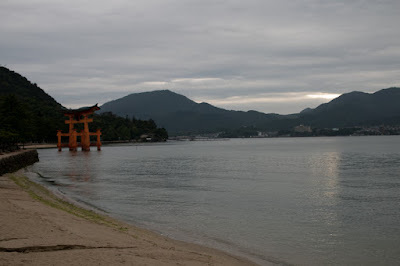 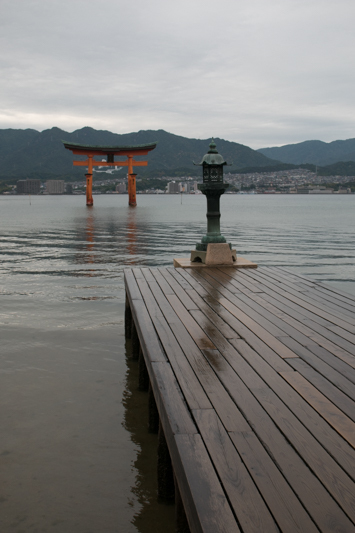 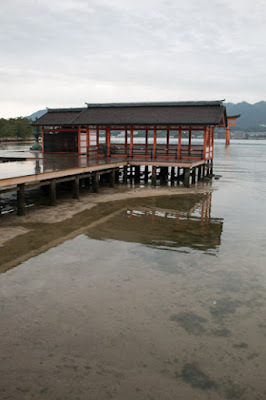 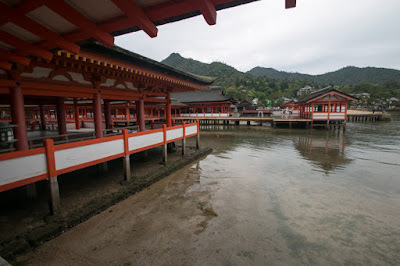 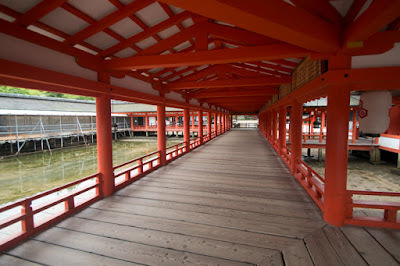 10 minutes walk from MIyajima Ferry terminal at Itsukushima island. 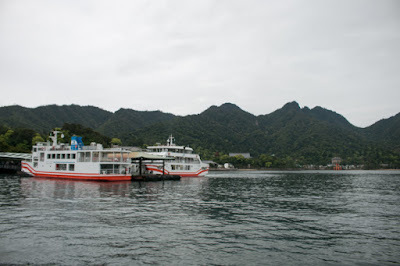 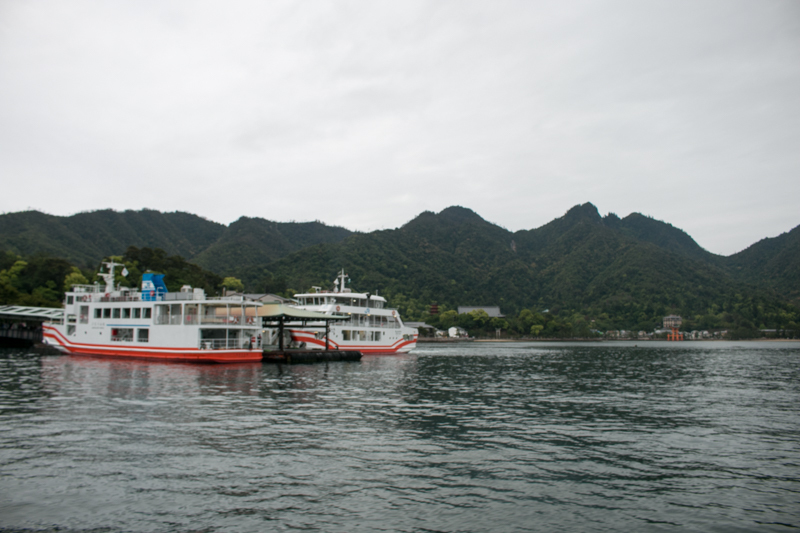 6 minutes walk from JR West Sanyo-Honsen line Miyajima-guchi station or 10 minutes drive from Hiroshima-Iwakuni Doro toll road Hatsukaichi interchange to Miyajimaguri Ferry terminal, where Miyajima ferry departs.